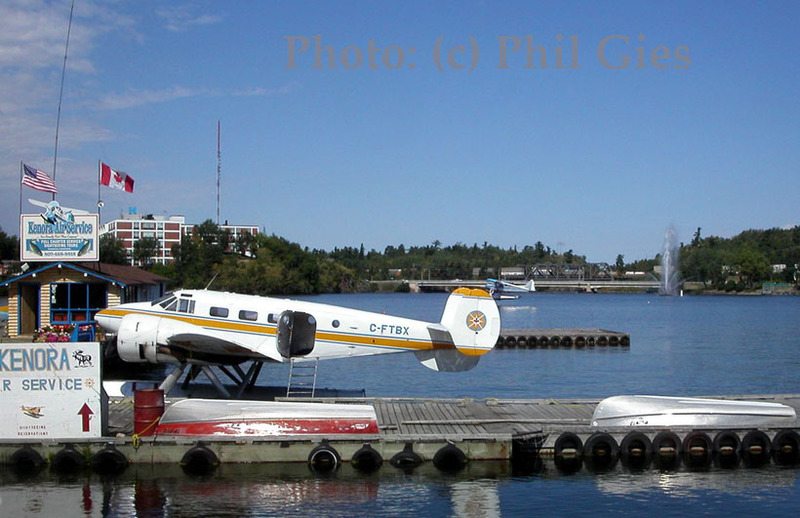 Phil Gies sent me this photo in Aug.2007, showing the beautiful Kenora Seaplane Base in Ontario (Canada). In the front sits C-FTBX, a Beech D18S (also named the 'Twin Beech') with c/n A-479. 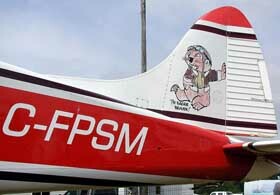 It was registered to Kenora Air Service on 24Feb06 and Phil took a fine day to shoot this photo. In Oct.2007 I went to Kenora myself, a report can be found on Canada07-Kenora. "My name is Rick Barter and I am based at the Avra Valley Airport, now called Marana Regional. We always get left in the shadows with no mention ever given! 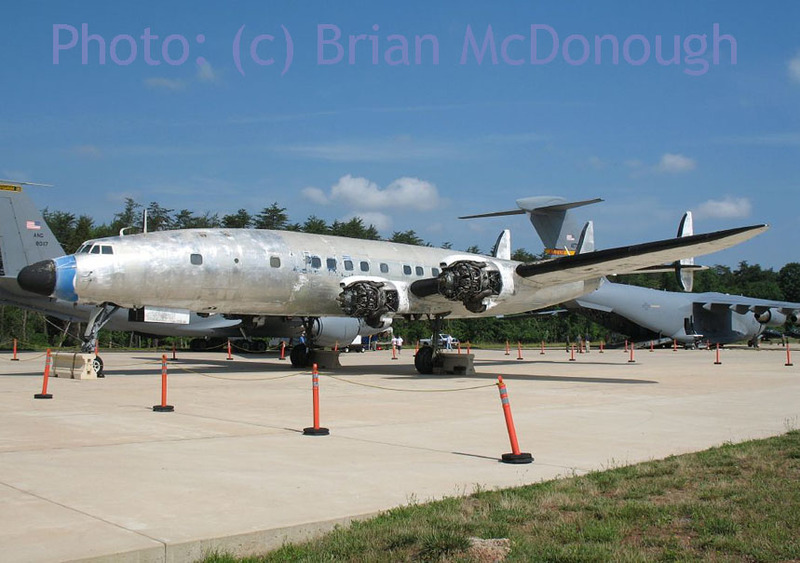 I restored an aircraft that is on display in the Smithsonian Air and Space museum and with many articles written about it and again we are always left in the shadows with no mention." The photo shows Rick Barter on the left and Sean on the right. Other photos by Sean Keating can be seen here. Engine run up at Puyallup,WA. 100554: Accepted by SCRT (06.10 hrs) + engines Alvis Leonides Mk.12701 n° 948 (08.30 hrs) and 949 (10.00 hrs) and TOC by <20s/15W(Flight Communications). 150457: Cat.2 at Melsbroek. Right wing hit hangar door during towing.1SM Cornelis unhurt. 040757: Cat.1 at Chièvres. Hit landing light during taxi on perimeter track. Kpt.Lorent unhurt. 090878: Flown to Blackbushe (UK) to be equipped with extra fuel-tanks and instruments for long-range flights. 000000: Used in contraband but never caught. 150284: Donated to Denver Aerospace Science Museum, 12078 East Oregon Circle, Aurora, Col.80012 in exchange for RM12. 000584: Flown to the museum in Denver, Co.
150785: Application for Special Airworthiness Certificate for crew training and proficiency. 000000: Based at Centennial Airport, Co.
100399: The aircraft is nearly 95% complete and could easily be brought to flying status. 191099: still registered N66PK; owner : Wawi Inc.
George Chomokovski sent me these photos in August 2007. 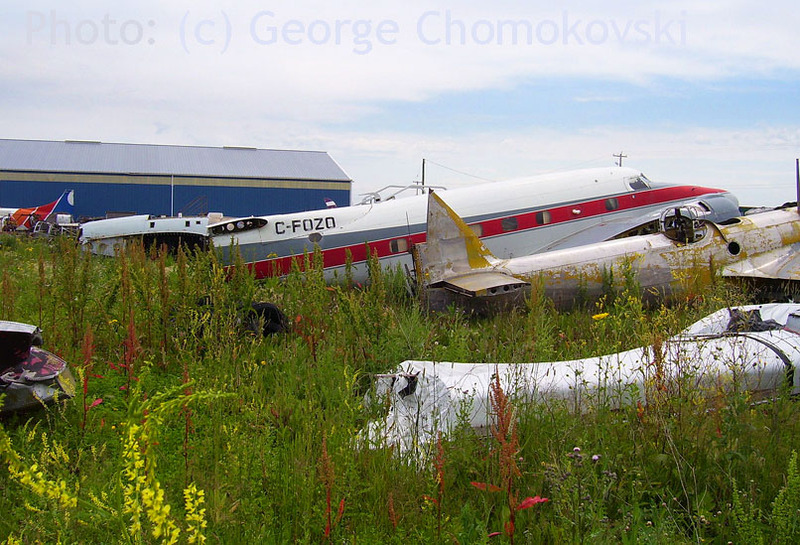 C-GCDX was photographed by George at its homebase Selkirk,Manitoba on 18Aug07. Passengers are seen boarding into DHC-2 Beaver C-GPHI (c/n 838). C-GPHI was registered to Enterlake Air Services Ltd of Selkirk,Man. on 24Apr02. 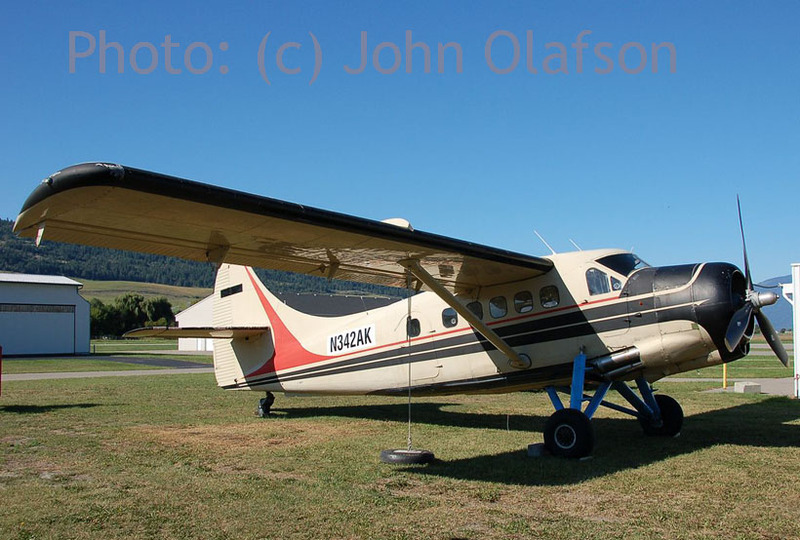 John Olafson sent me these photos and comments of an everlasting DHC2 Beaver in August 2007. Here is Beaver C-FBVR c/n 1548 photographed at Vernon on 09Aug07. This stunning Turbo Beaver was converted to turbine by Viking Air of Victoria recently and is owned by a numbered company in Alberta. 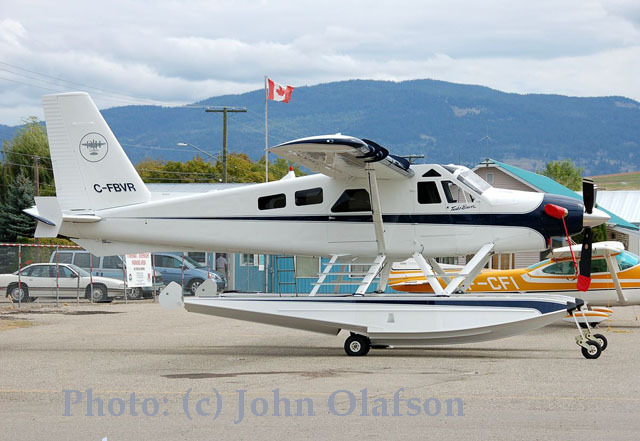 This DHC-2 Beaver was formerly registered as C-FPSM (c/n 1548, see above, I photographed FPSM at Campbell River in 200,3 when it was still a piston engined Beaver. I think it received the "Eager Beaver" paint scheme earlier on when it was in New Zealand as ZK-CGX. The staff at Viking do an incredible job with rebuilds of Beavers. Just perfection in every way. "Several days after photographing C-FBVR at Vernon I received the news that it had landed at Penticton, BC airport with the wheels up. 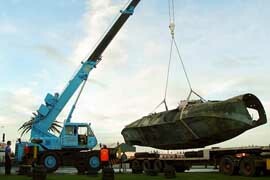 After talking to the chaps at Sealand Industries here in Vernon, they figured the damage to the Wipline Amphib floats would be minimum and that the Beaver would no doubt fly out of there very shortly." 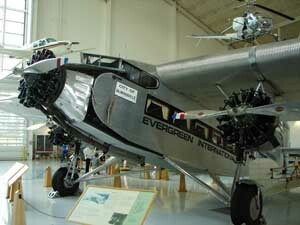 See also DHC-2.com for history and more photos. C-7A Caribou RP-C2702 was used by Jan's Helicopter Service, flying tuna fish in the Philippines. Does it still? For more photos of propliners in the Philippines & elsewhere, please visit Ron Mak's webpage on this website. The C-119G is registered N5216R, its airtanker number 137 can be read on the jetpod. 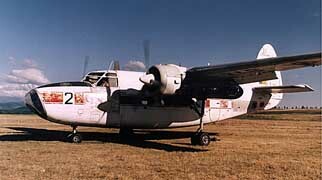 This Packet has construction number 10956 and did service with the Royal Canadian Air Force (RCAF), serialled 22131. 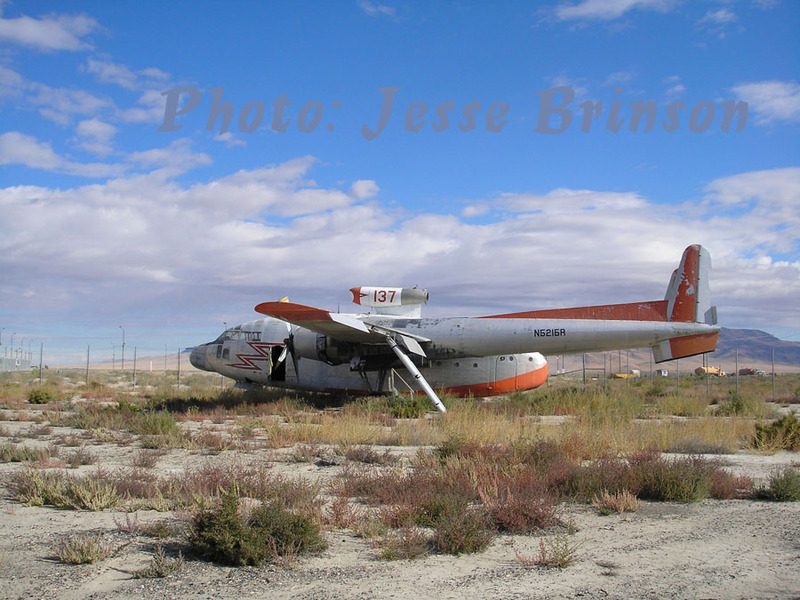 For more photos of this aircraft and others at Battle Mountain's deserted air museum, have a look at Jesse Brinson's webpage on this website. In 2018 an initiative got under way to move N5216R to Alaska; ownership seems to be tangled in some foggy paper trail involving the government and the local county. For more see my page on Battle Mountain,NV and 2018 updates on Photos by Friends & Guests #53. 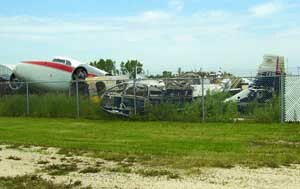 An interesting peek, I would say, into the storage yard of the Western Canada Aviation Museum (www.wcam.mb.ca), which one can visit in Winnipeg but has this facility in St.Andrews (about 15 miles north of Winnipeg on highway 9). This Lockheed Lodestar is easy enough to indentify by information from Joe Baugher's website: Lockheed C-60A-1-LO Lodestar, serial batch 42-55845/55859, directly ordered by USAAF. C/n 55848 to NR66 July 1945, later N66E. 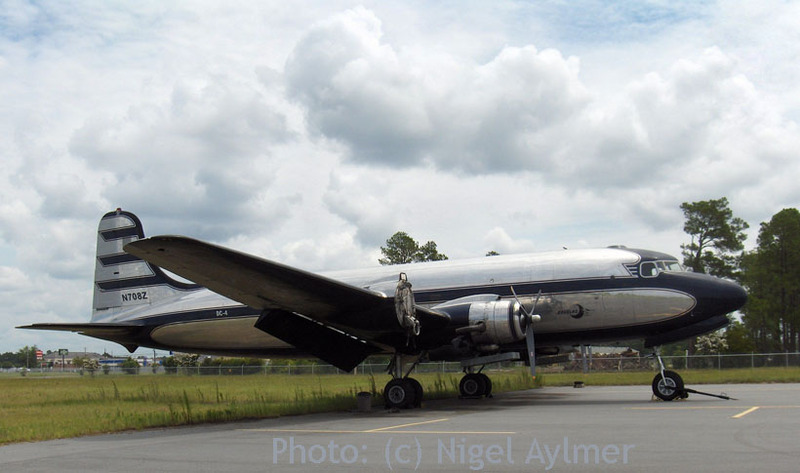 Converted to Learstar II in 1956; by 1963 it was registered N815AC, in Feb69 became N8157C. To CF-OZO 25Feb70, to N9987F in Dec76, to C-FOZO of Terra Surveys Ltd in May 1982. 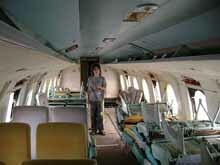 It was badly damaged at Nanisivik on 12Aug84, when the undercarriage collapsed. Can someone help me in identifying the other 2 airframes in the photo on the left?? "The two airframes in the WCAM storage yard are a Bolingbroke IV and an Anson V.
Both are listed on various sites as belonging to the museum, but there are no identities given. Compare it to this Austin Airways Anson on Airliners.net"
"Both types were used extensively with the British Commonwealth Air Training Plan (BCATP) during WWII. Many of them flew all over the Canadian prairie provinces then. 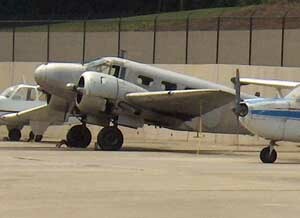 It looks to me like the Anson had seen some civilian use, as it is not the typical yellow used by the BCATP. It is probably one of the later all metal versions too." Purely from a photographer's point of view I was about to dismiss with this photo, until I found that the airframe in the back, C-FLOL, is a Saunders ST-27 ! The Saunders ST-27 regional airliner was build in the 1970s by the Canadian Saunders Aircraft Company in Gimli, Manitoba, Designed as a conversion of the earlier de Havilland Heron, the ST-27 was the most radical DH Heron conversion program, featuring two Pratt & Whitney Canada PT6 turboprops and a stretched fuselage. 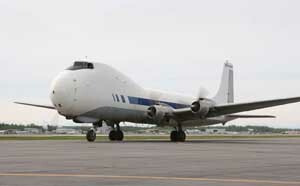 Despite its promise as a regional airliner, the project collapsed when Manitoba government funding was withdrawn. More on Wikipedia. I hope the museum is able to renovate this rare survivor, if only because it is a 'local product'! Through the fence I can barely make out the tailnumber: CF-FCD. By googling I found this interesting website www.seabee.info/seabee_museum.htm about preserved Seabees. It has the following remark: "It is not confirmed that the WCAM has a Seabee in storage. Well, we can now conclude that there is a Seabee in storage! " 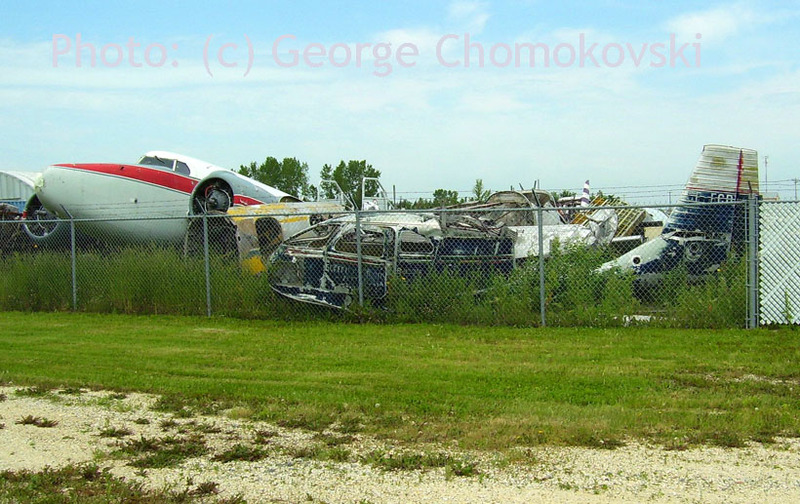 During Sep.2007 I visited the museum in Winnipeg myself, see HERE... Unfortunately I could not find the time to detour along this storage yard (the museum has exhibits stored in various places). 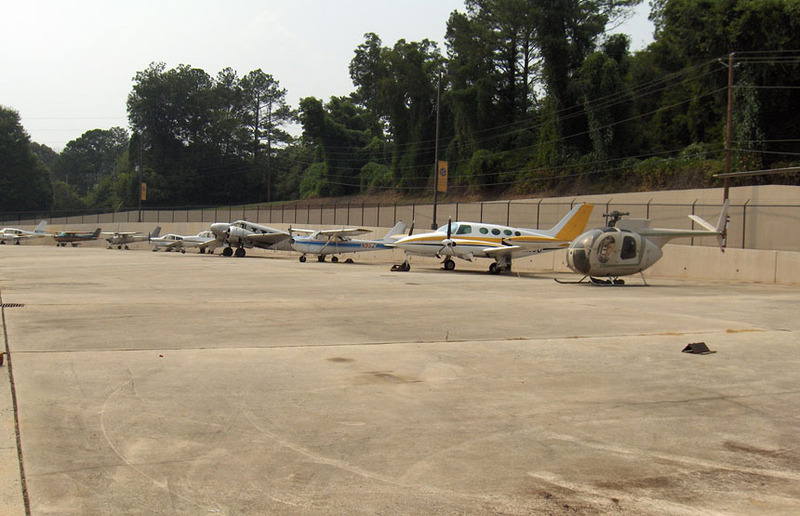 "Called in at the Atlanta Technical College, on 06Aug07. Not exactly in the best part of town, but it was a success. The Beech TC-45J, N3484 c/n 4292, was present in the usual silver, with no marks at all. Guess this is fairly 'off airport'; you can Google Earth the College. 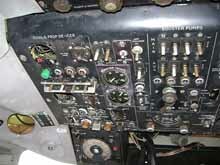 The info on the airframe is taken from USA Military out of Service, 2003. It is not ideally parked for a photos, but the best I could do under the circumstances." "C/n 4292, SNB-2 39208 USN accepted on 15Jan43. Delivered to Chief AOTC NAS Lake City, FL 23Jan43. To CQTU Glenview 1944. Reconditioned in Mar45 Corpus Christi. OTU VFN-1 1945-46. Radar School St Simon, GA 1946. NATTC Memphis 1947. Overhauled at Corpus Christi Apr48. 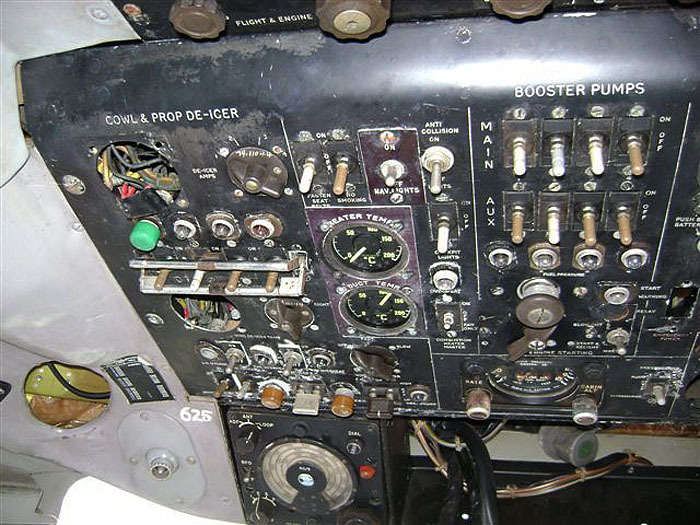 Remanufactured to SNB-5 (new c/n N-637) and delivered on 09Mar51. Redesignated TC-45J on 18Sep62, then UC-45J on 14Oct64. Into storage at MASDC. Struck off 30Apr68, as UC-45J. Registered N3484 to Atlanta Area Technical School, Atlanta, GA (sources: USRR Suppl Sep74 & CAR Jul75, Aug76 not listed Dec76). Seen at Atlanta Tech in May97 and 06Aug07. It seems to have been redesignated as UC-45J while in the USN, but was civil registered as TC-45J??" It seems this Beech was offered for free (!) after it was sold thru 'Govdeals', then offered on Barnstormers.com for parts... See my item on Photos by Friends & Guests (48). "I found a picture on your site of the Vickers Viscount CF-THG c/n 224, as it was being transported by barge from Vancouver to Victoria. I happened to be visiting my parents on Vancouver Island when the aircraft arrived at the British Columbia Aviation Museum (www.bcam.net), and I took great interest because my father was a captain on the Air Canada Viscounts in the 1960's (along with all of his pilot friends at the time)." "I was visiting Victoria this week and went to see the Viscount again. 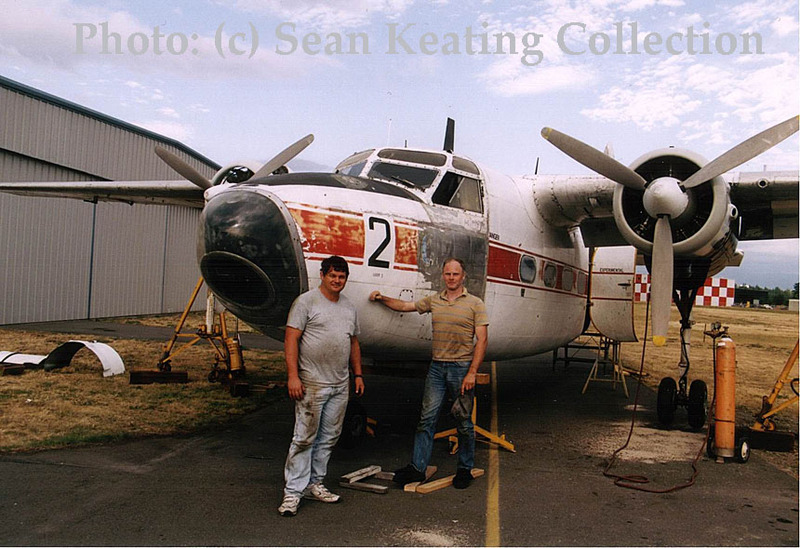 It is currently being restored to its original TCA livery by several of the retired pilots (all family friends). 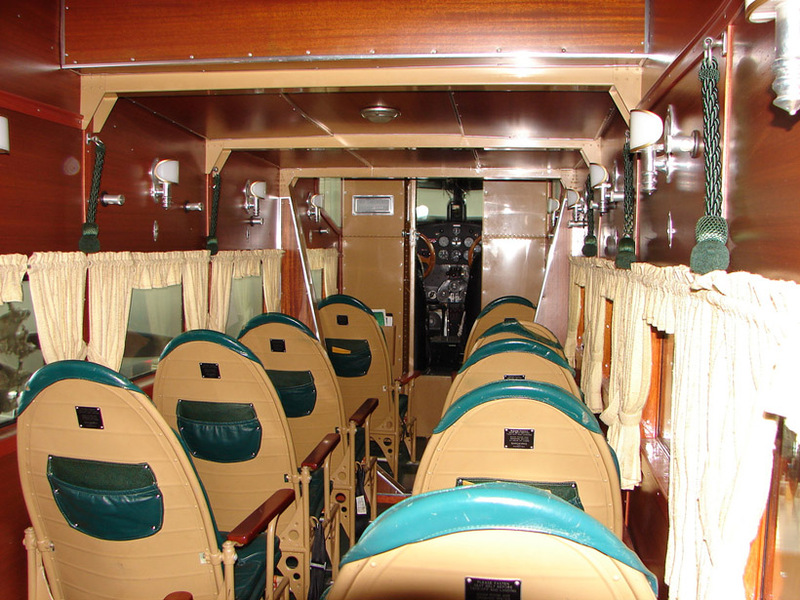 I was fortunate to be able to walk around, inside, and on top of that beautiful plane with my father and the other Viscount pilots as they were working on it." "The photographs date from 03Aug07, with the restoration just beginning. 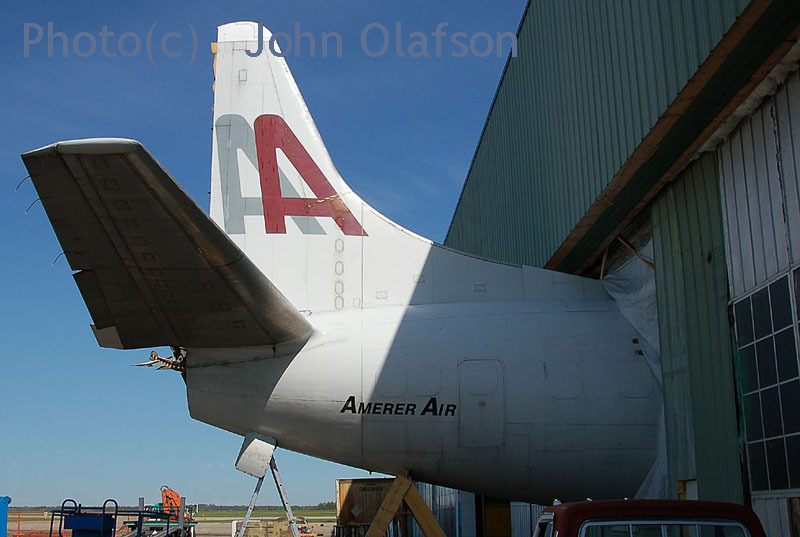 Here is some information on the pictures- Picture top: shows the masking for the old Trans-Canada Airlines markings. They will be removing all of the white and red, stripping the plane down to bare aluminum in the coming months, to match the original paint scheme. 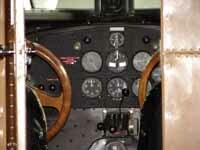 The cockpit is currently gutted as they have removed most of the panelling for restoration. 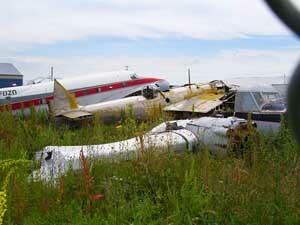 The pilot in charge tells me that they hope to have restorations complete by summer of 2008." 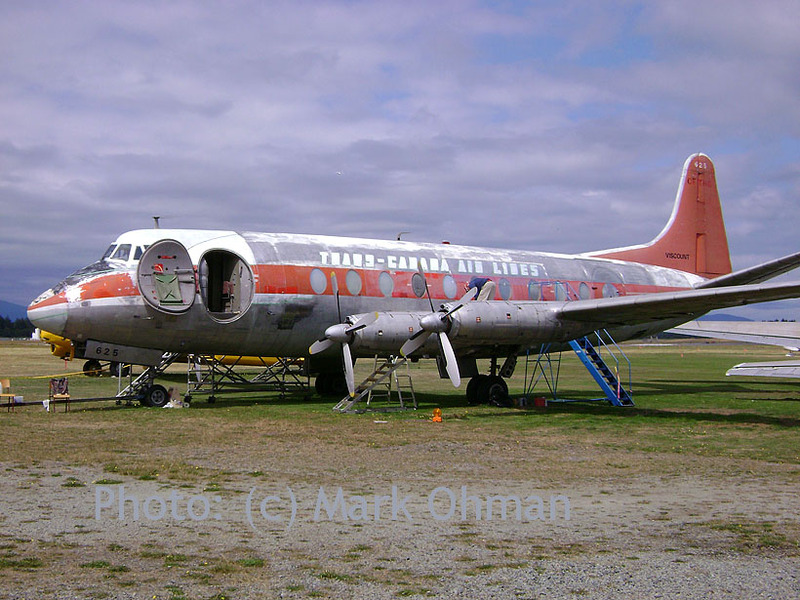 In Dec.2008 Sean Keating sent me a link: "update for your website… the Viscount has now repainted..
First flight 19Mar57 - delivered to TCA 28Mar57 as CF-THG. TCA became Air Canada on 01Jun64. CF-THG was stored on 16Feb64 (ttl 35.405 hrs, 37.561 cycles). Sold to United AIrcraft Services Ltd on 27Apr74. Sold to Beaver Enterprises 10Jun75. Sold to Harrison Airways 21Jan77. 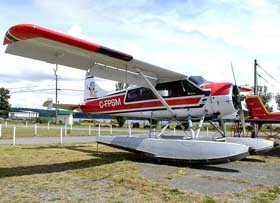 Sold to the Pacific Vocational Institute on 10Jun80, withdrawn from use and used as a ground trainer at Vancouver, B.C. Transferred to the British Colombia Institute of Technology in Oct83. 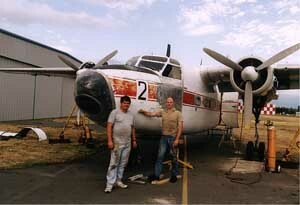 Late 1995 moved outside the hangar. In June 2003 noted discarded on south side of Vancouver IAP. Moved May 2005 by barge to the BC Aviation Museum at Pat Bay, Vancouver Island. "PBY5, it finally has arrived...", that is how I initially received these photos, without much proper identification, relayed 'via-via' on the Web. But fortunately Glenn Johnston reported back, he took these photos and he wrote: "...they cover the arrival of the hull of what I understand is a PBY-6A to Classic Flyers NZ.Com at Tauranga Airport, New Zealand on 01Aug07. 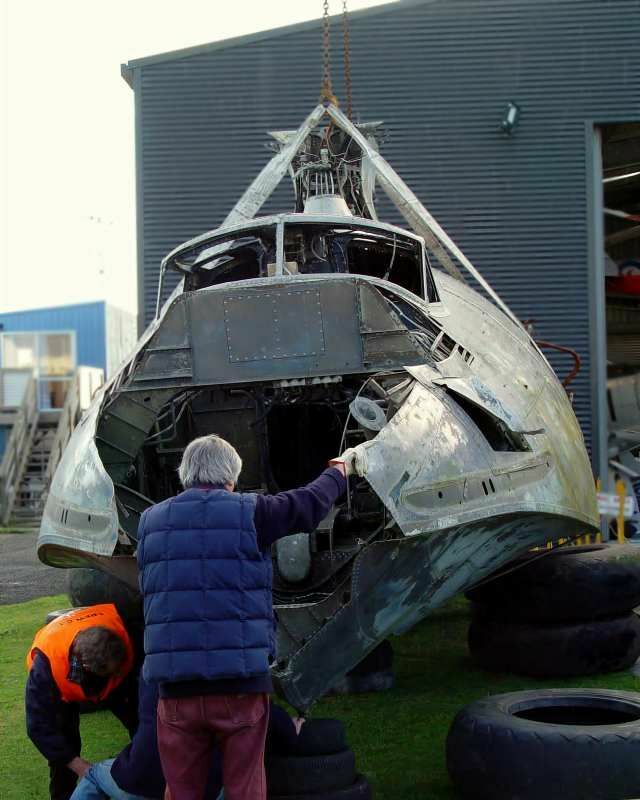 The hull was brought from Ardmore airport in Auckland, where it had been stripped to provide parts for the Catalina group's PBV-1A ZK-PBY which itself makes flying visits to Tauranga from time to time. It is intended that the hull be restored as a static exhibit with appropriate interior equipment and exterior colour scheme and our volunteers have already made a start on this. My particular responsibility as a volunteer at Classic Flyers is to produce data for its museum display. We are currently researching the aircraft's history for this purpose." 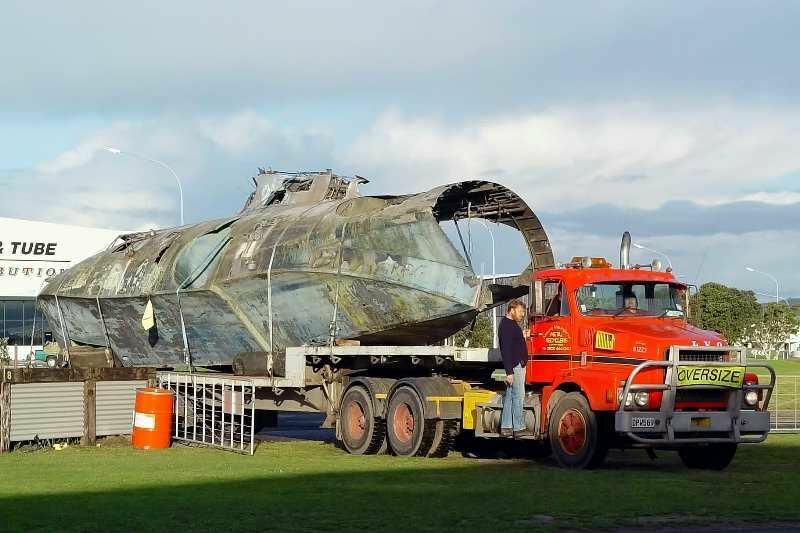 Recently identified as the one-time US Navy PBY-5A BuAer48334, more recently N74821 and N9535C, the hull of this Catalina had moved around the world from Long Beach and Hemet in California to Ephrata in Washington before going to Auckland. The Catalina Group passed the hulk on to Classic Flyers at Tauranga in August 2007, after stripping it of useful spares for ZK-PBY. At Tauranga, volunteers set to with initial focus on rebuilding the bow section which had been removed some years before in the USA. Progress was rapid and by the end of Winter 2009 the entire hull had been tidied up and painted as a San Diego-based US Navy Catalina with the hull code ‘204’. 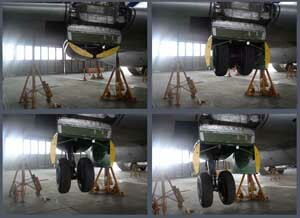 The project group had previously decided that no attempt would be made to obtain wings and a tail section to replace the missing originals. Instead, the intention is that the hull will in due course become a ‘walk in’ exhibit once the interior has received further attention. On 07Mar09 the hull was lifted and positioned on a raised stand inside the museum hangar at Tauranga. Glenn wrote: "I enjoy the periodic visits of ZK-PBY to Tauranga. 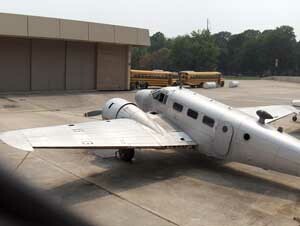 This photo shows this aircraft at Classic Flyers last year [02Sept06]." "I am sending 3 photos of the interior of PP-VBF, c/n 10156, taken at Rio de Janeiro [Galeao] taken 12Nov01. I don't have a digital photo of the aircraft to send..."
For the purpose of the exterior shot I have added a 1997 photo by Daniel R.Carneiro (used with permission); click on the photo for a link to Airliners.net. 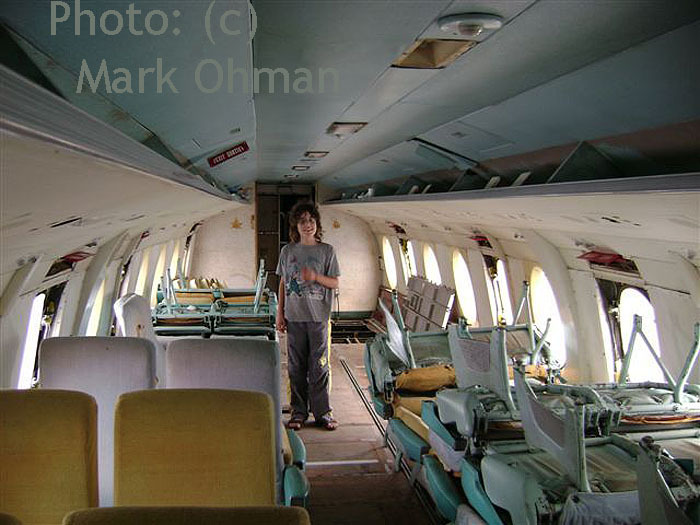 "The photo of the aircraft you used from Airliners.net shows the aircraft at an earlier location a short distance away. 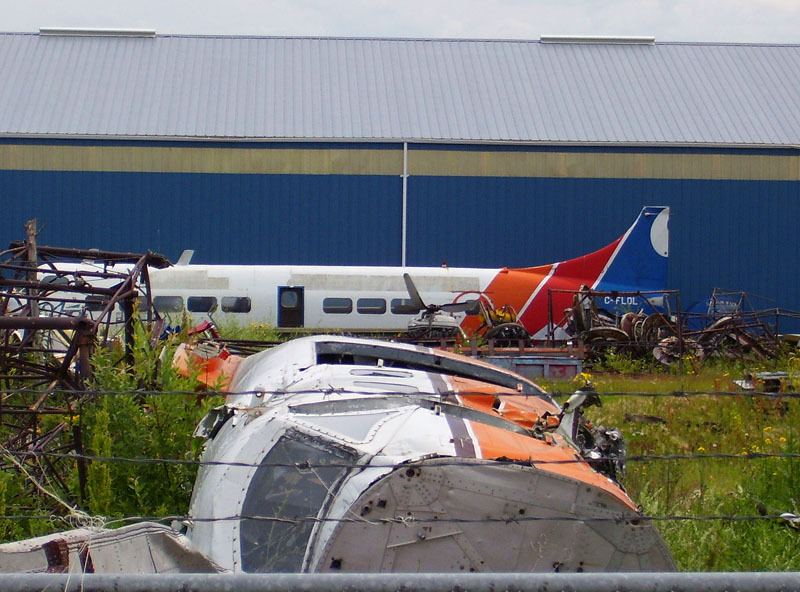 This location is next to the second security gate to the hangars; the land which the DC-3 occupied is now within the fenced area of the adjacent GE engine overhaul facility. 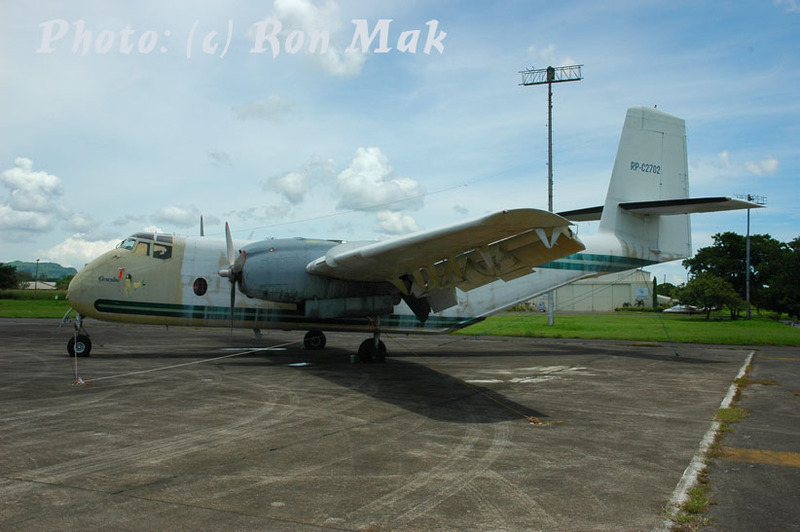 By the time I first saw this aircraft in 2001 it had been moved to outside the Ruben Berta Fundacion canteen and building, adjacent to the first security gate, making it more accessible." First flight 01-Dec-1928, delivered to Transcontinental Air Transport Jan-1929 as NC9645, named City of Wichita. Transferred to TWA (which was still called Transcontinental and Western Air then) in Apr-1931. To Mr. G. Ruckstell, trading as Grand Canyon Airlines, in Jul-1935. To Grand Canyon - Boulder Dam Tours in Feb-1937. To TACA Honduras Dec-1937, registration unknown. 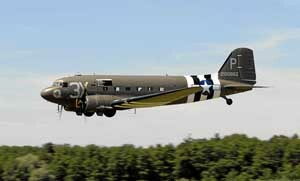 It also spent a period with an unknown operator in Nicaragua, as AN-AAS, as of 1942. To Ricardo Izurieta (Campeche, Mexico) Jun-1946 as XA-FUB. Sold to Arturo d'Argence (Campeche, Mexico) Aug-1950, reregd to XA-NET. During major overhaul and repairs at Mexico City in 1951 the Ford's regular corrugated skin was removed and replaced with normal flat sheet metal. Since then it was nicknamed "Smooth Skin Ford". Sold to Augusto d'Argence (Campeche, Mexico) Jul-1953. Accident Jan-1954, then stored in damaged condition. Acquired by Eugene O. Frank (Caldwell, ID) in Nov-1955 and regd as N58996. Not operated, stored in poor condition at Caldwell, ID. Sold to collector William F. Harrah from Reno, NV (of Harrah's Hotel and Casinos) in Jul-1964. He restored it to flying condition (at great expense), and reregistered it to N9645. It was flown a few times in the Reno area, but was then placed on static display as part of his famous automobile collection in Reno. Named "City of Reno". Harrah died in 1978 and part of his collection (a large part still exists as a display collection in Reno), including the Tri-Motor, was auctioned off in Jun-1986. The Ford was sold to Gary Norton, trading as Norton Aero Ltd. (Athol, ID). Finally, in Feb-1990, it was acquired by Evergreen, but it remained in storage at McMinnville, OR until about 1996, when restoration to flying condition was started. It is/was occasionally flown to airshows, but can normally be found on display in the Evergreen Aviation Museum as NC9645, painted with Evergreen International titles and named "City of McMinnville". 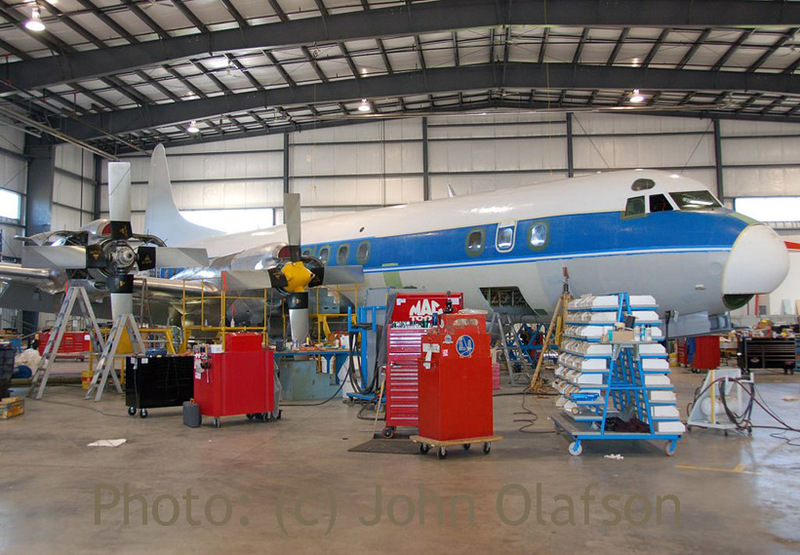 A little update on the BAHF efforts & progress to bring back to the skies this beautiful classic propliner: the Boeing C-97 Stratocruiser. 55 of these Boeing aircraft from the 1940's & 50's became known as the 377 Stratocruiser. 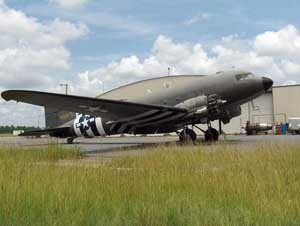 The rest went into military service with the USAF & ANG units to serve as cargo lifters & airtankers. Out of a production run of 888, only 2 survive in the world today which could be made airworthy. 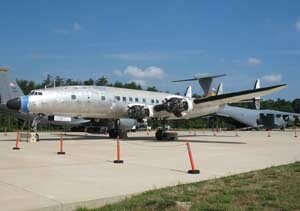 The BAHF owns and operates C-97 52-2718 (N117GA c/n 16749), one of the two, and is destined to become a "Flying Museum" of Cold War history, when the project is complete. 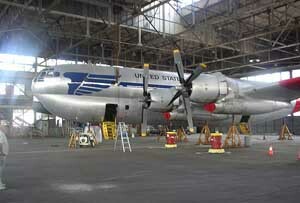 The project, in historic Hangar B at Floyd Bennett Field in NY, is well underway; the all volunteer maintenance workforce saw in July 2007 another milestone completed with this gearretraction test. Photos © by Kevin Kearney, Vice-President, Berlin Airlift Historical Foundation. Check out the website www.spiritoffreedom.org for more details. 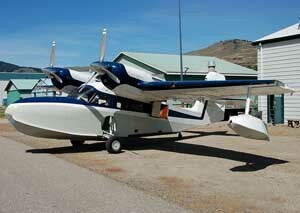 "Otter N342AK, of Wings Airways in Juneau, is the latest one to come to Vernon,BC to be turbinized. It came here last week and I am really looking forward to seeing it as it emerges from the Kal Air Repair hangar, several months down the road. One may recognize it as ex/ C-GPPL, formerly of Hawk Air in Ontario and I read in Karl Hayes' excellent CD history that it was the first Otter delivered to the RCAF by deHavilland in 1953! 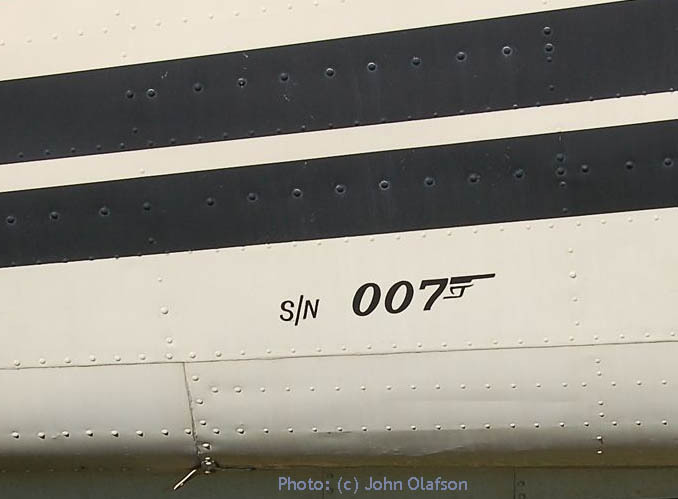 Note the James Bond style logo on the fuselage..."
Photos © John Olafson, taken 31Jul07. 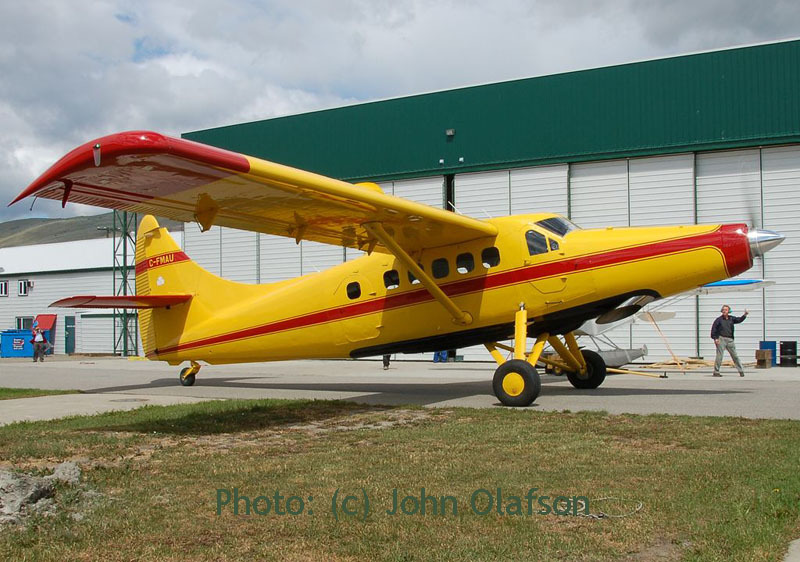 Otter c/n 7 was the first Otter delivered to the Royal Canadian Air Force (RCAF), on 28th March 1953 with serial 3661. After Otter 3661 had been formally delivered by DHC to the RCAF, it was allocated that month to the Central Experimental & Proving Establishment (CEPE) at Rockcliffe, Ottawa for the purposes of evaluation of this new type of aircraft to enter RCAF service. It then went to the Fort Churchill, Manitoba Station Flight, where its arrival is recorded on 04Jul53. 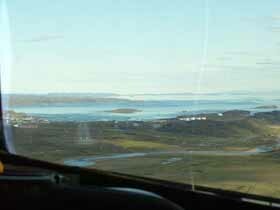 It entered service with the Flight alongside Norseman 789. The diary of the Churchill Station Flight records the many missions undertaken by 3661. It operated on floats during the summer months from Landing Lake at Churchill. On 14Aug53 it operated a medevac to Baker Lake and on 20th August was in the Duck Lake and Neultin Lake areas searching for a lost trapper. Later that month it was involved in the search for 405 Squadron Lancaster 999 which had crashed, and performed a coast crawl from York Factory to Eskimo Point. When the Lancaster was found, its crew of 8 were picked up by the Otter from the lake where it had ditched and were flown to Churchill. 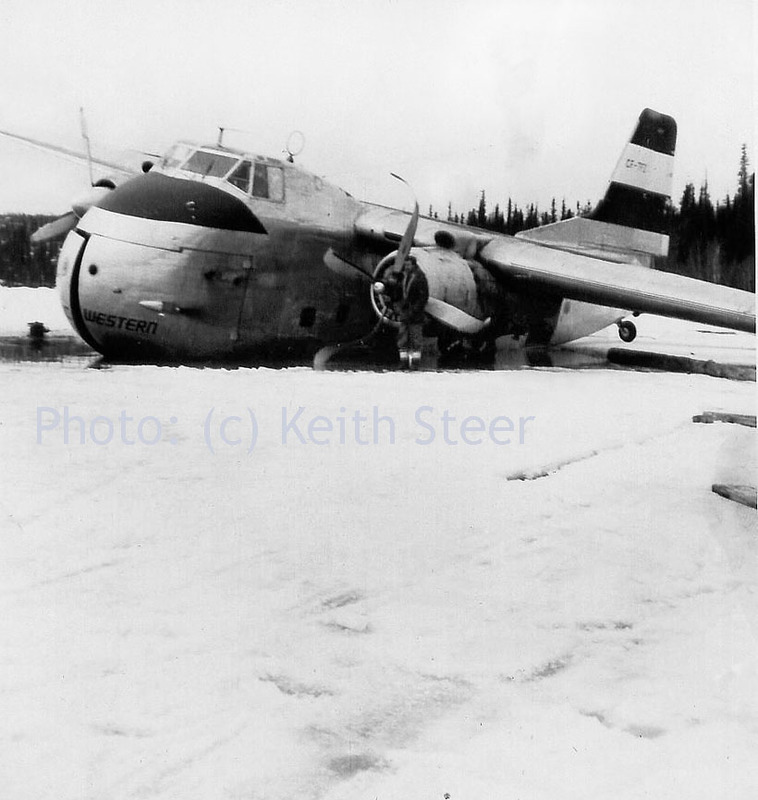 On 06Oct53 the Otter made its last float trip to Knife Lake and on 8th October was removed from Landing Lake and re-configured with wheel-skis. 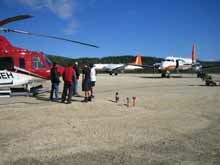 For the winter months, it would operate from the airport at Churchill, continueing with its light transport and SAR taskings. Early 1954, the Otter was re-assigned to RCAF Station Rockcliffe, Ottawa. 3661 entered service with 408 Squadron, adopting its MN code. Although based at Rockcliffe, the squadron spent much of its time deployed away from base, having been assigned the major task of mapping and surveying large tracts of the Canadian North. During the summer of 1954, four of the Squadron's Lancasters flew out of Goose Bay, Labrador on the mapping project, supported by six of the Squadron's Cansos and six Otters, including 3661. At the end of the summer season, 3661 and the other Otters returned to base at Rockcliffe for the winter, where they were engaged on local area flying and training. Another major task entrusted to 408 Squadron was support of the construction of the Mid Canada Line (MCL) of radar sites along the 55th parallel of latitude, all 102 of them. 18th June 1955 Otter 3661, in company with 3664, both on floats, departed Rockcliffe and arrived at Fort McMurray, Alberta on 21st June. The function of the two Otters was to carry men and equipment into places that were inaccessible to the Squadron's Canso, which was also supporting the operation. The Otters remained with the operation until it reached The Pas, Manitoba. In November 1962, 3661 was taken out of service and put into storage by No.6 Repair Depot, 45 Trenton. Here it remained until March '63, when it was one of 5 RCAF Otters selected by the Canadian Government to be donated to India. All five were trucked to DHC at Downsview and crated for shipment to India, the official transfer date to the Indian Air Force being 25th April 1963. On arrival in India the Otter was allocated serial BM-1004 with the Indian Air Force, with whom it served for the next 27 years, until withdrawn from use in 1990. In April 1993 the Indian Ministry of Defence advertised for sale by global tender “8 Otters on the ground since 1990 and 5 Otter airframes (without engines)”, which included BM-1004. 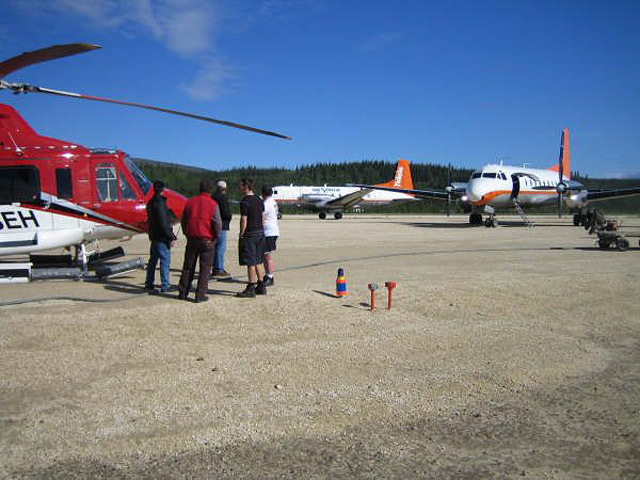 The successful bidders were La Ronge Aviation Services of La Ronge, Saskatchewan jointly with Mike Hackman Aircraft Sales of Edmonton. 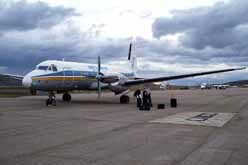 They eventually arrived at Saskatoon, Saskatchewan by 30Apr94. BM-1004 had at that stage of its career 5,051 hours on the airframe. 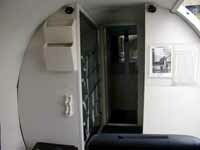 It was put up for sale, along with all the other former Indian Air Force Otters. They were advertised for sale “as is”, or else the sellers would arrange for the aircraft to be rebuilt to flying condition for a customer. Otter number 7 was purchased by Watson's Algoma Vacations Ltd, trading as Watson's Skyways, based at Wawa, Ontario. 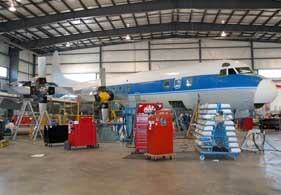 It was trucked from Saskatoon to Echo Bay, Ontario where it was rebuilt for its new owners by Skyservice. On completion of the rebuild, it was registered to Watson's Algoma Vacations Ltd on 26Apr95 as C-GPPL. There was a change of name of the registered owner on 28th February 2000 to Watsons Skyways Ltd. C-GPPL joined Otter C-GOFB in service with Watson's Skyways. The Otters were based at Wawa and during the summer months were used to fly fishermen to two lodges, Pine Portage and Kaby Lodge, which the company operates on Kabinakagami Lake in the Ontario interior, one of which is located sixty miles from Wawa, the other seventy. 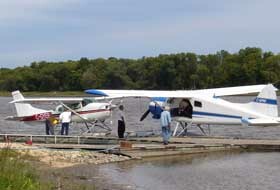 The Otters were also available for general charters, and often flew for the Ontario Government's Ministry of Natural Resources, flying fire crews and Ministry personnel into the bush. The Watson's Skyways operation is summer only, the Otters being stored during the winter. 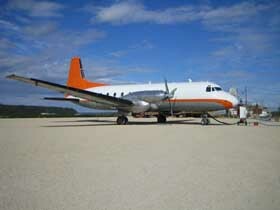 C-GPPL remained in service with Watson's Skyways until the end of the summer 2000 season and was then placed in storage for the winter at the Springer Aerospace facility at Bar River, to the east of Sault St.Marie. 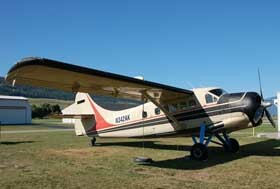 In September 2000 it was advertised for sale, having been replaced in service with Watson's Skyways by a Cessna Caravan. 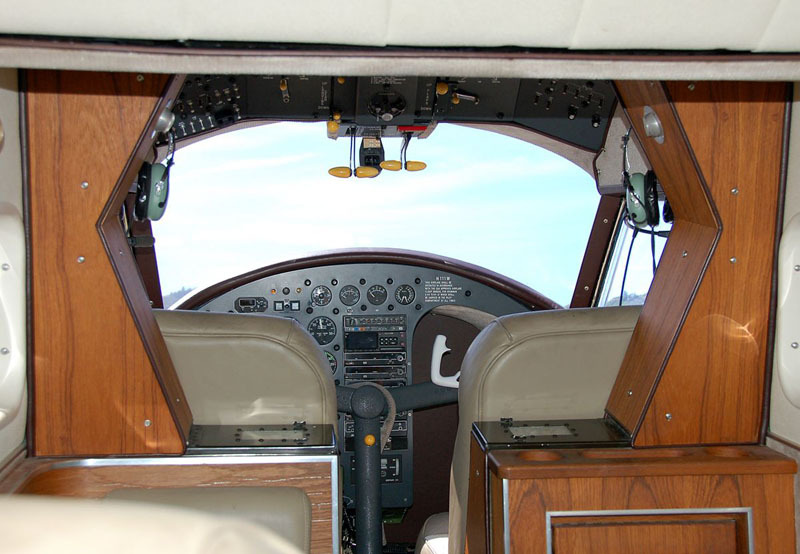 The advertisement quoted an asking price of $590,000 Canadian, with the aircraft on EDO floats, ten passenger seats, wingtip strobes, vista vents in the two crew and four passenger windows, and well equipped with avionics, including HF radio and a Garmin GPS. 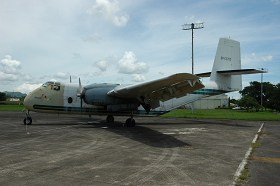 It was sold the following month to Hawk Air of Wawa but remained in storage for the winter at Bar River, being registered to its new owners on 11th April 2001. 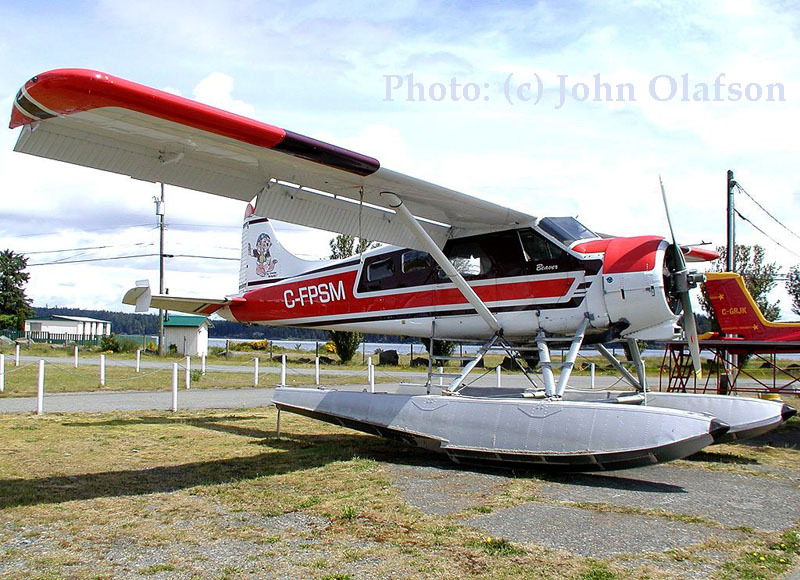 C-GPPL joined Otter C-FQMN with Hawk Air and continued to serve the Ontario bush country, flying fishermen to outpost camps and supplying lodges during the summer season. 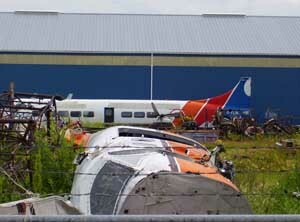 C-GPPL was involved in an incident on 15Jun04. 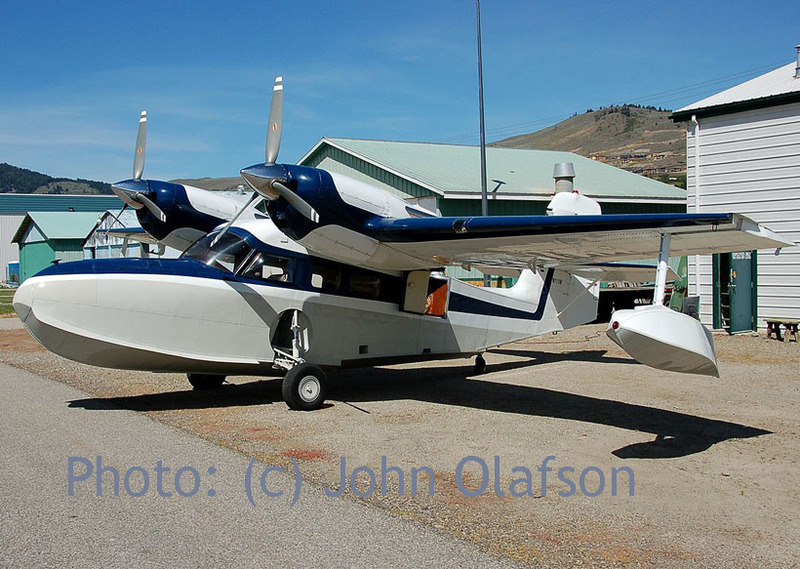 Eight minutes after it had taken off from Hawk Junction en route to Esnagi Lake the engine quit and the Otter was forced to make an immediate landing on Dipneedle Lake, some ten miles north of Hawk Junction. The lake was extremely narrow shortly after the point of touch down. The left wing struck two dead trees, resulting in damage to the outer four feet of the leading edge of the wing. 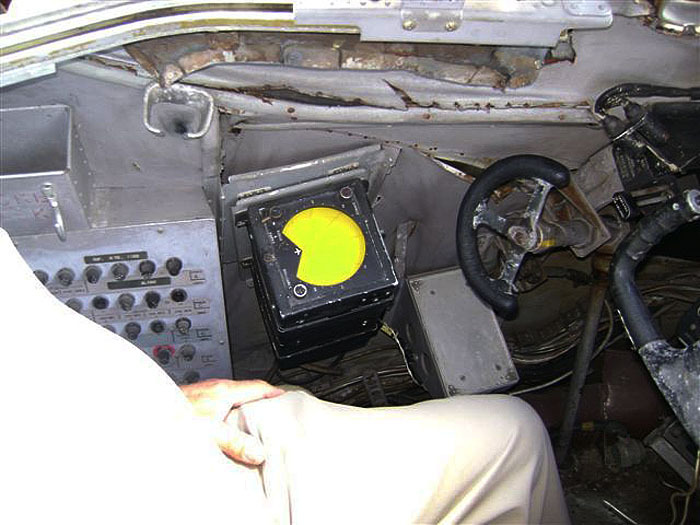 Approaching the shore, one float struck a submerged rock, resulting in a one foot hole in one compartment. There were no injuries to the five passengers or the crew of two. The Otter was repaired and resumed service with Hawk Air. C/n 007 was registered to Alaska Coastal Airlines (dba Wings Airways, of Juneau,AK) on 30May2007. Dean Steer sent me these photos, made in 1956 by his father, Keith Steer. 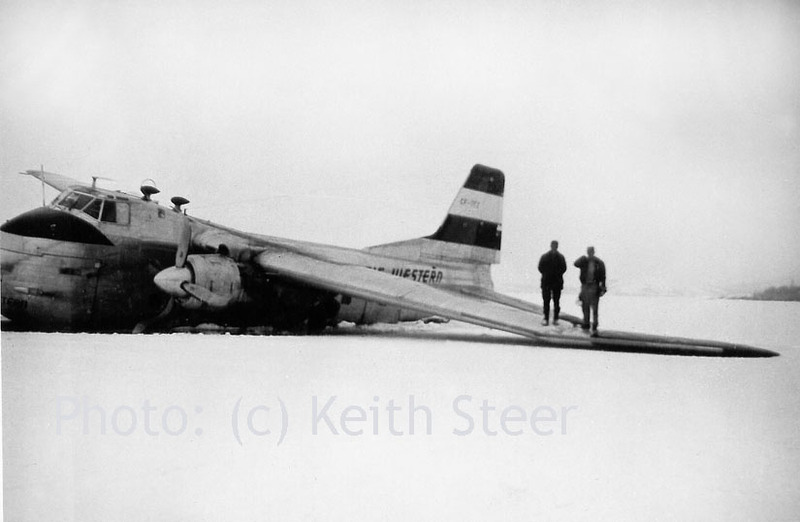 Dean wrote: "My father was an Aircraft Maintenance Engineer for Pacific Western Airlines; he was at the scene and took these photos of CF-TFZ on the ice." 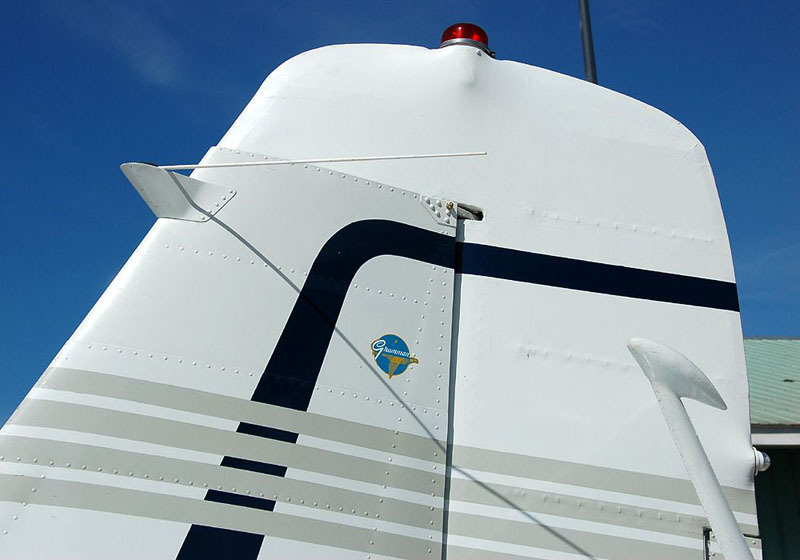 Details as on Aviation Safety Network (ASN). 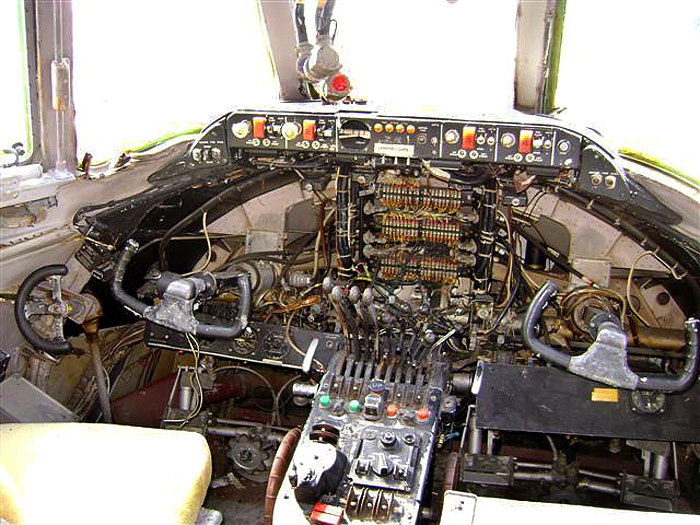 The aircraft was described as "written off". 19?? The aircraft was registered as G-AMRX. 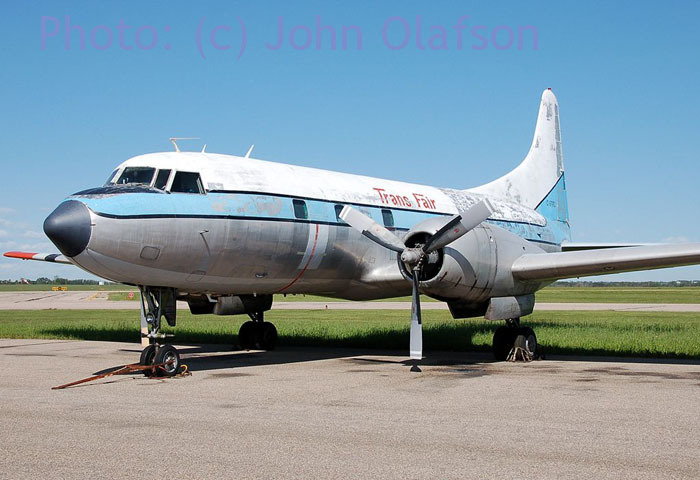 1953 The aircraft was acquired by Trans Canada Airlines and was re-registered as CF-TFZ. 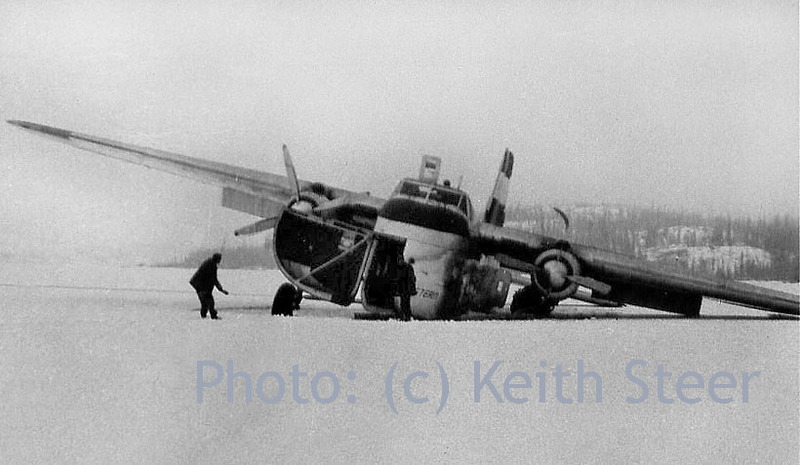 30May1956 The port undercarriage leg broke through the ice while landing at Beaverlodge Lake, Canada and the aircraft was written off. 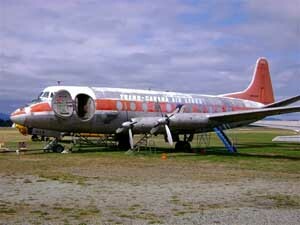 In 1971 we were flying in a Bristol Freighter to an abandoned WWII emergency landing field, approx. 600 miles north of Yellowknife (Pelly Lake) to do an EM survey (in a single engine Otter) for Giant Yellowknife Goldmines. What a crash that would have been!! I doubt if there would have been any trace left of the plane or us. "Visiting Vernon (BC) 09Jul07, this is a Grumman Widgeon G44-A built in 1945, and it came from Reno. According to the lady who arrived with it, they have been touring a bunch of lakes here in BC. It sure is pretty inside and reminds me of a cabin cruiser in a way. Lovely decoration on the cupboard door. 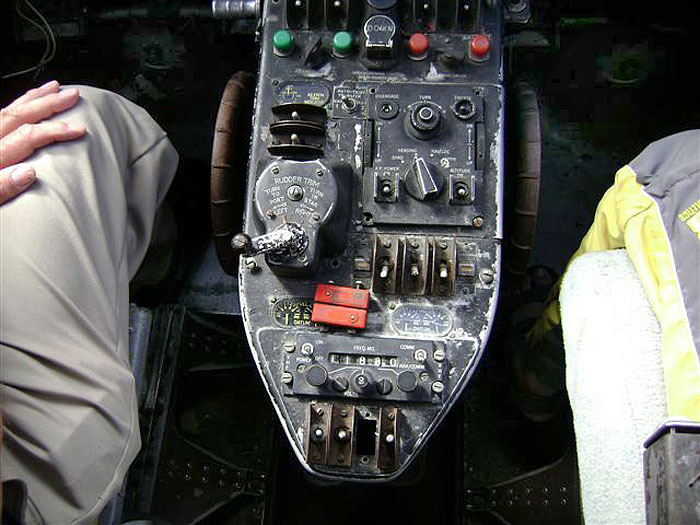 All the control surfaces are fabric covered. It has been modified with the big Lycoming engines and 3 bladed props. Must be a nice performer with that power." There have been not 2 but 3 airplanes that have carried the registration N111W. The first was c/n 1361 (BuAer # 37731, N75222, N111W) and was owned by Diamond Drilling Co., an oilfield exploration company, based in the New Orleans, Louisiana area. 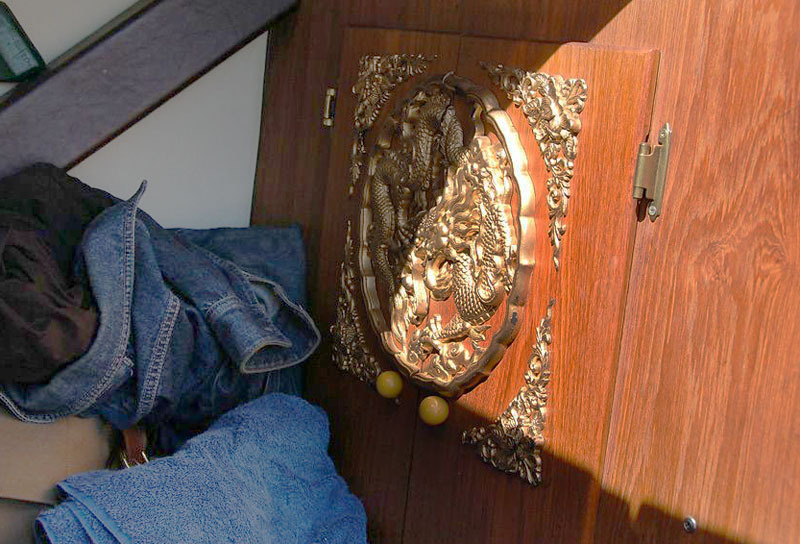 It was lost after sinking in the Mississippi River near New Orleans in the late 1960s or early 1970s. The pilot and two passengers were rescued by a passing boat. There were no injuries and no trace of the airplane has ever been found. Diamond bought another Widgeon and sent it to McKinnon-Hickman in Sandy Oregon for conversion to a Super Widgeon. This was c/n 1420 (NC 41989, N33S, N338S, N111W). In the mean time they leased a Super Widgeon from McKinnon to use while their new airplane was being converted. 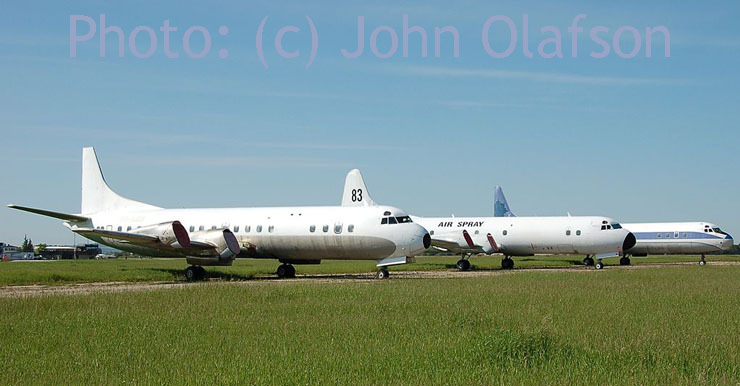 This was the second N111W, c/n 1380 (BuAer #37750, N66435, N111W, N75222, N45CA, N45PV). Diamond flew this airplane about a year until their NEW N111W (c/n 1420) was completed, at which time c/n 1380 was returned to McKinnon and re-registered as N75222. Diamond took possession of their new airplane, flew it about 10 years then sold it. It was wrecked in an off airport landing accident a year or two later. Steve bought it and had it restored to its current condition and has maintained it in airworthy condition ever since. Couple of pictures, taken 25Jul07 at KDQH, speak for themselves." This is Douglas C-54G-10-DO tailnumber N708Z (36067/461) and is owned by Brooks Fuel of Fairbanks,AK. It stranded here with engine problems and though I had learned that an engine was shipped during Dec06 it clearly has not yet been installed. 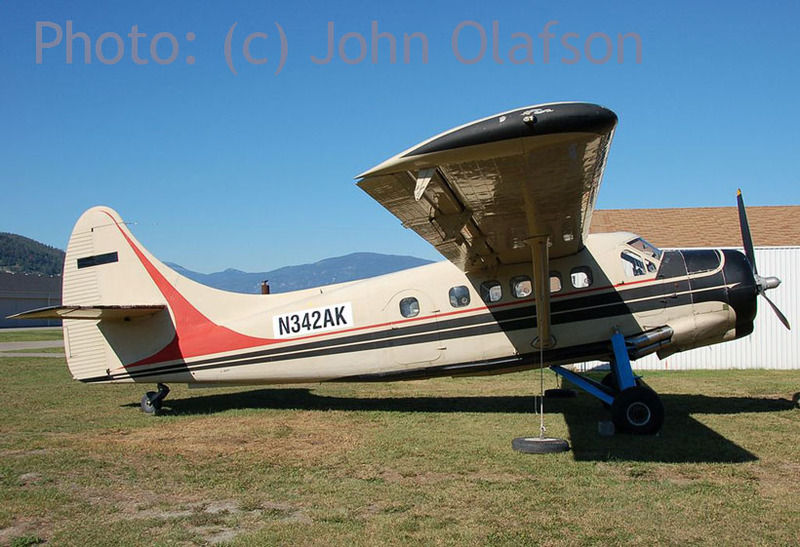 N99FS has c/n 12425 and was registered to Brooks on 31Mar89, however FAA's website "N-inquiry' shows the remark 'Undeliverable Triennial', meaning a Triennial Aircraft Registration Report was returned by the Post Office as undeliverable... I suspect this means the company is out of business? N99FS is ex/ 42-92606 and KG395; the RAF handed it over to the Canadians in 1946; when struck of charge it was supposedly reregistered C-GZCR but this was not taken up. John Olafson sent me these photos, taken at Vernon,BC on 19Jul07. As I have an interest in the use of aircraft for fighting fires and recently also became interested in the DHC-6 Twin Otter, I am happy to share these photos on these pages. C-GIGK (c/n 492) is owned by North Cariboo Air from Fort St. John, BC. 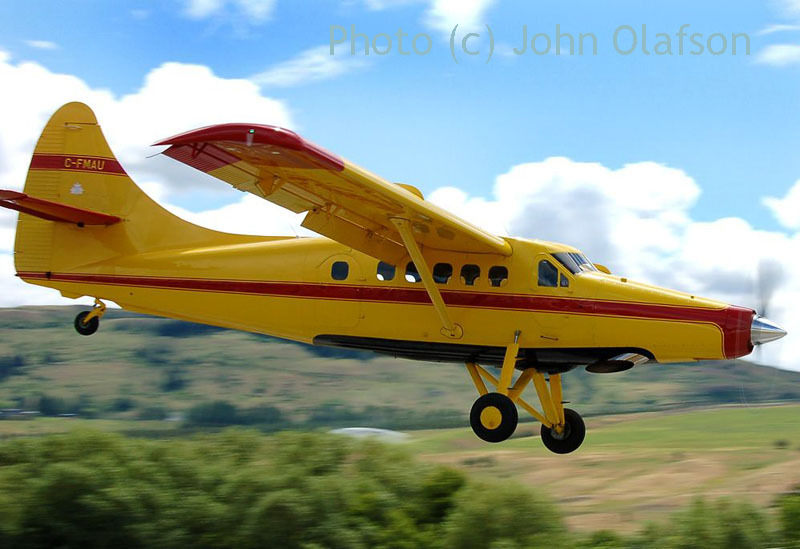 This DHC-6-300 Twin Otter spends the summers on contract to the Forest Service, carrying smoke jumpers to forest fires. Here are the S2 Tracker and T21 Photos on the Easy Street Fire. 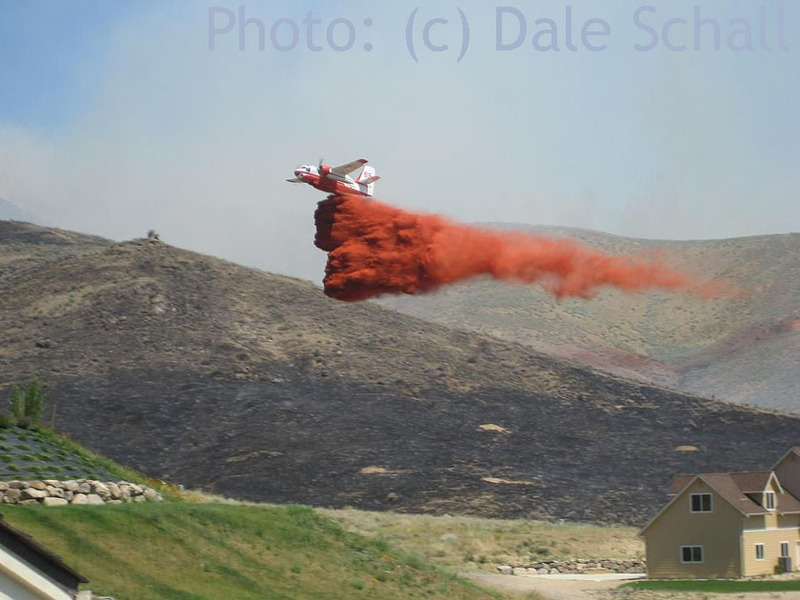 This fire burned in Wenatchee,WA. 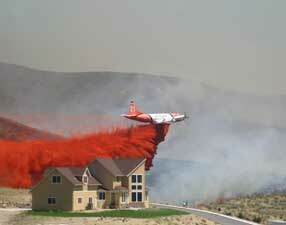 The fire started on Easy Street and quickly spread toward the Eagle Rock subdivision, threatening many homes. 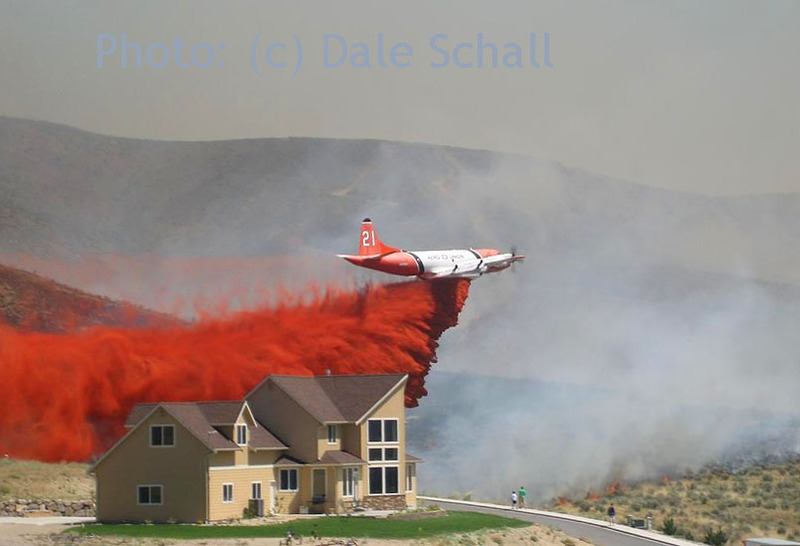 Some 250 homes were evacuated, but many others enjoyed the action of the airtanker planes. No homes were lost due to the timely action by the firefighters. In correspondence about a C-46 wreck in Manitoba,Canada the fact was noted that there had been two C-GIXZ registered Curtiss Commando's; c/n 22453 ended up abandoned in Manitoba and c/n 22495 had crashed in Kenya. Brian Maddison replied with a photo of the 'Manitoba' C-GIXZ photographed in Vancouver (1978). 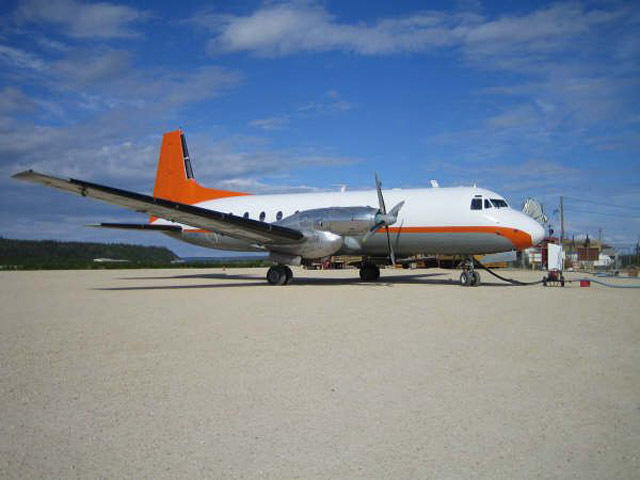 "Tanker 83 C-GYVI appears to be retired as it has been relieved of its retardant tank and engines and a few other items". I have reported my 2006 visit to Red Deer on a page on Buffalo Airways and one on Air Spray. In 2007 I went for a REVISIT. This Lockheed Electra (c/n 1112) in 1990, N360WS for Air Bridge on Airliners.net. 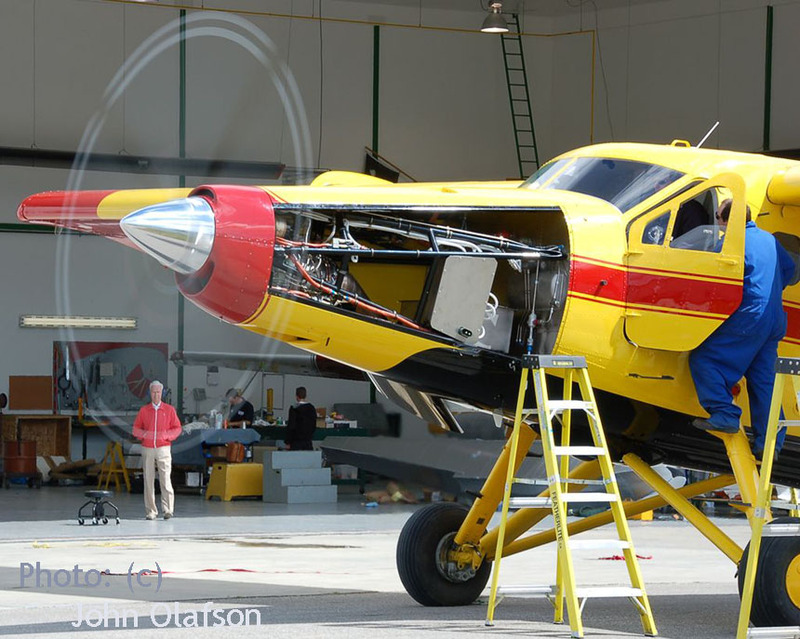 "I am sending a photo of L188C C-FLJO c/n 1103 taken inside the Air Spray hangar. 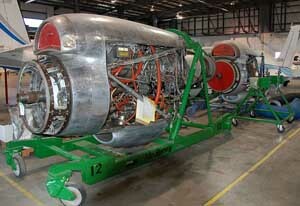 As you can see it is nearing completion as an air tanker with all engines in place and the retardant tank added. I don't know if it will be seeing service this year though." I saw it converted to Tanker 82 during my visit 24Sep07. While I was there I noticed a contractor was getting ready to build an extension to that hangar which will allow an aircraft to be completely enclosed. I'm sure the maintenance crews will greatly appreciate that when it plunges to minus fourty next winter!" 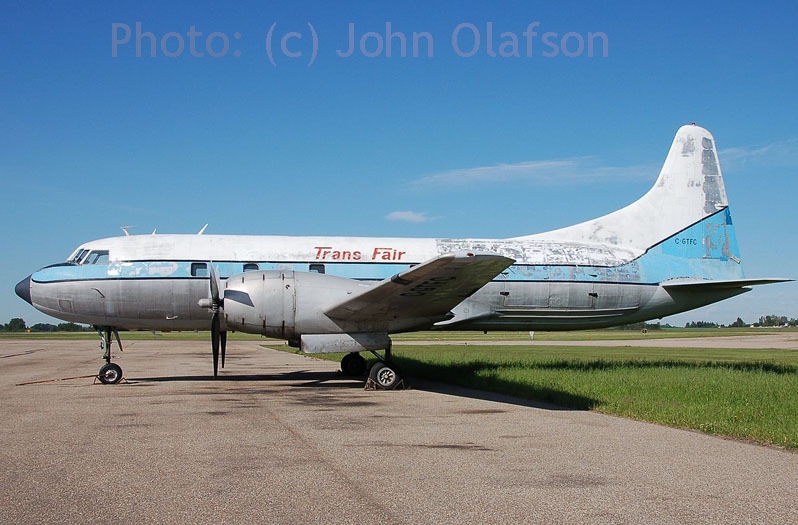 "I spotted this very sad looking CV240 C-GTFC (ex/ N152PA) at Red Deer and it has been registered to Buffalo Airways for a couple of years. Perhaps it has been brought to Red Deer to be made operational in the freighting role. It goes without saying that a new paint job is required. 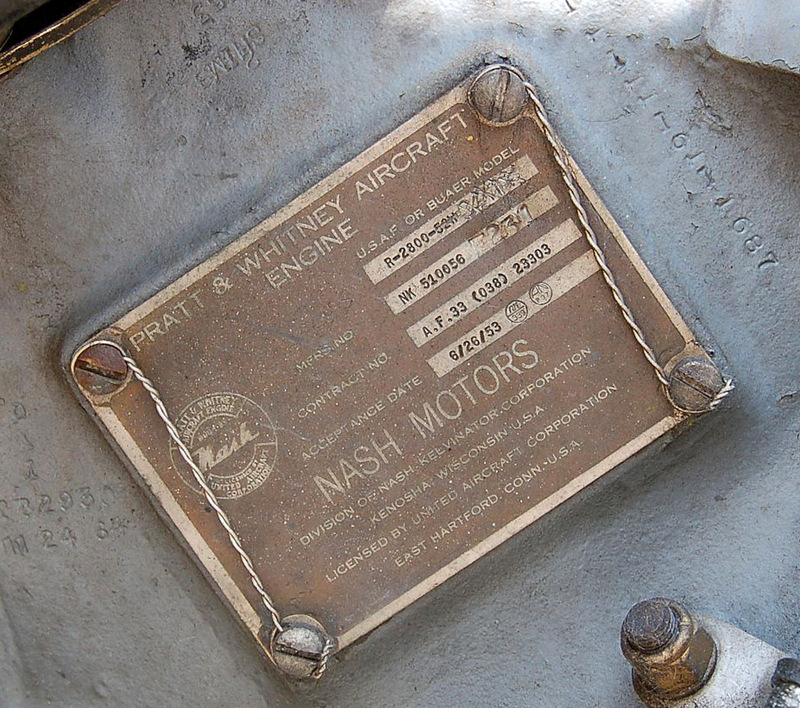 I found it quite interesting that one of the R2800 engines was made by Nash Corporation, maker of things like automobiles, Kelvinator refrigerators, stoves etc." Arnold Begeman sent me also a report recently, from Red Deer in the snow. 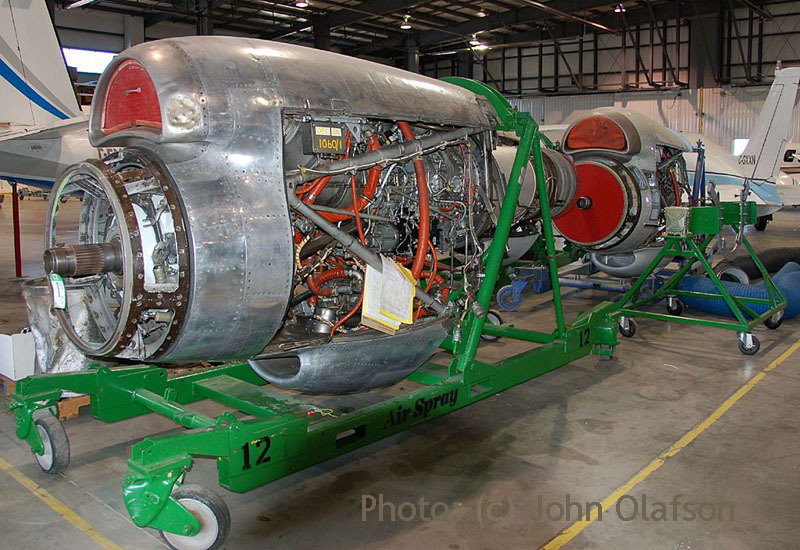 "Also a photo of a couple of massive L188 engines inside the Air Spray hangar." 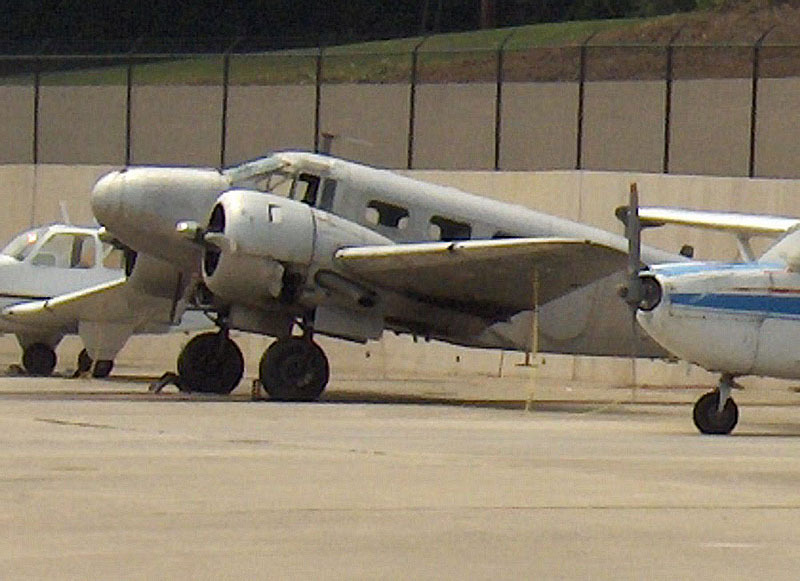 The Lockheed L.188 was the first turboprop airliner built in the USA. It first flew in 1957 and when first delivered had performance only slightly inferior to that of a full jet aircraft, at a lower operating cost. But most operators considered jets as the future and went to Douglas (DC-8) and Boeing (707). The photos of the orange & white airplanes are taken in Old Crow, Yukon Territory. I was up there with C-FAGI hauling fuel from about the 15th to the 18th of June this year. You will note C-FAGI had no decals other than the registration. We were in a hurry to get on with the fuel haul and loaded the tanks as the paint was still tacky..! In that series, C-FYDU appears in the background. It was there as part of our daily scheduled service to that community. 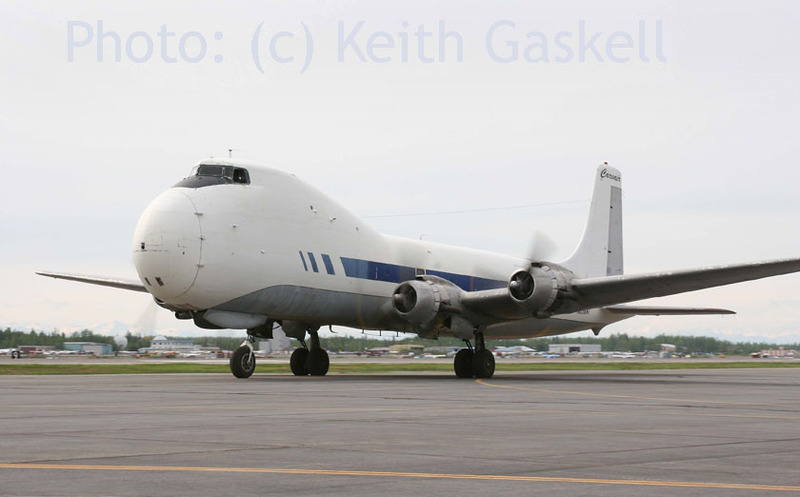 I have included also one shot of C-FAGI in the old colours, leased (see below) from Mount Cook, in Iqaluit, Nunavut. I went with the airplane on a charter for the military in August of 2006 to Quebec City. The routing was; Whitehorse-Yellowknife- Iqaluit- Quebec City- Kuujjuaq (Que. )- Iqualuit- Yellowknife-Whitehorse. The whole operation took 5 days! 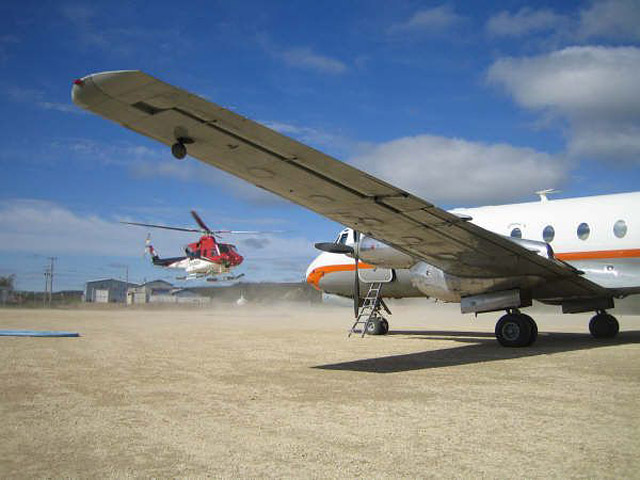 "C-FAGI was never leased from Mount Cook AL; it came straight from Air Manitoba. I have pix of it still in Air Manitoba's colours. Air North originally bought two Hawkers from Mount Cook, incl. 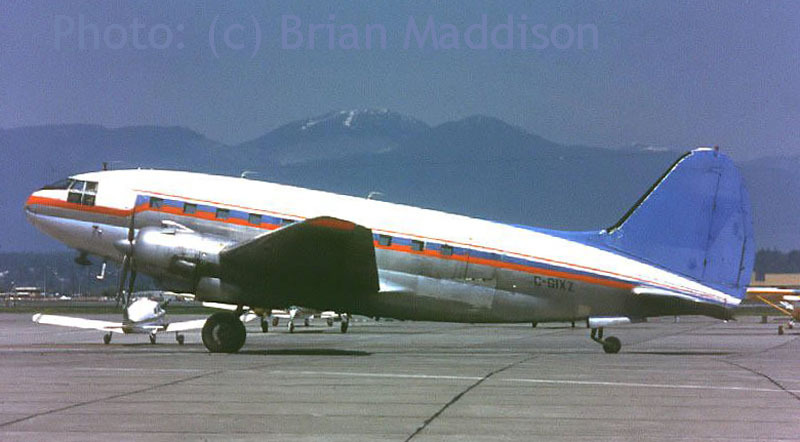 'DYU; they liked the Mount Cook colours so much that they adopted them for their own Air North aircraft; so when FAGI was purchased from Air Manitoba, this aircraft also received the old Mount Cook scheme..."
ATDB.0rg supports Dirk's statement; the career of C-FAGI is described as Regionair - Calm Air Int'l / Air Canada Regional (leased & returned) - Quebecair - Air Manitoba - Wassaya Airways (!) - Air North Charter (current Oct.2008). 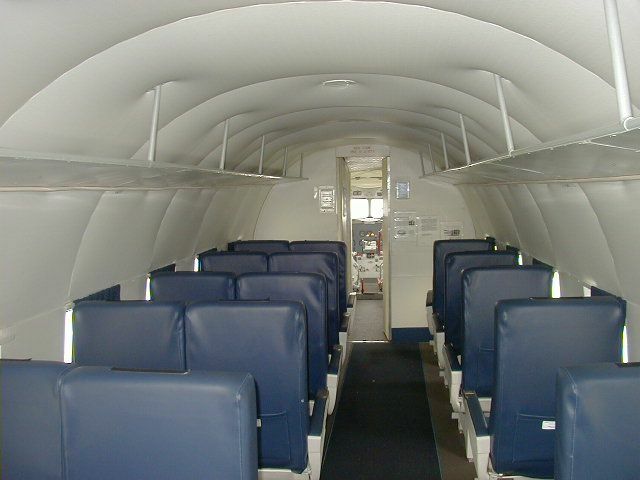 "As far as I am aware, Air North have purchased outright all four of their HS 748s. Only two of these came from Mount Cook C-FYDU (1694) and C-FYDY (1661). 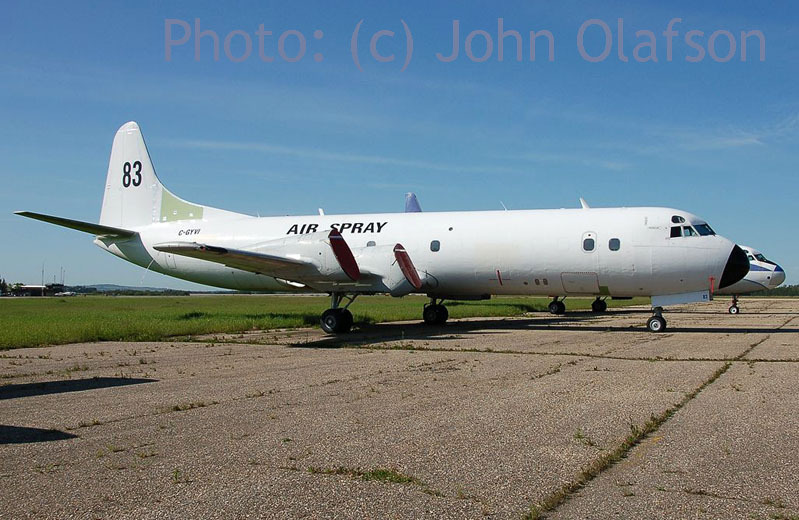 C-FAGI (1699) came from Air Manitoba and C-FCSE (1679) came from West Wind Aviation." 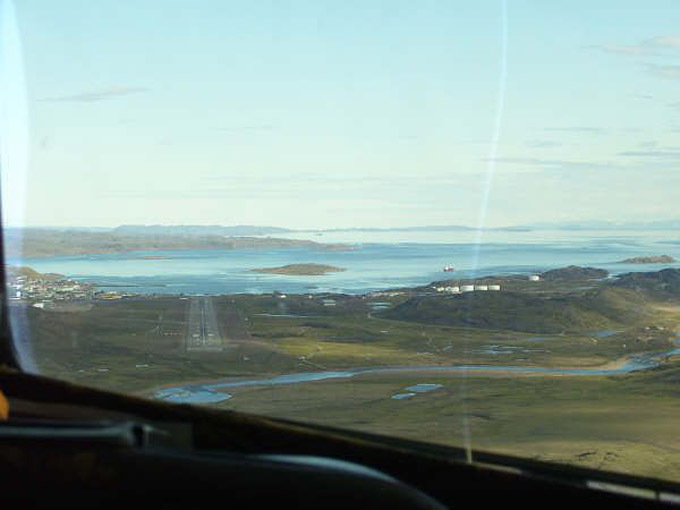 "I also include a shot through the windshield, from my position in the jump seat of 'final' for Iqaluit." Carvair N898AT seen here on 30May07, photographed by Keith Gaskell at Fairbanks,AK. Read more on my website about N898AT. Stefan Wunderlin sent me this fine photograph of Drag-em-oot zooming past; N473DC is seen doing a low pass at Friedrichshafen (D) on 14Jul07. 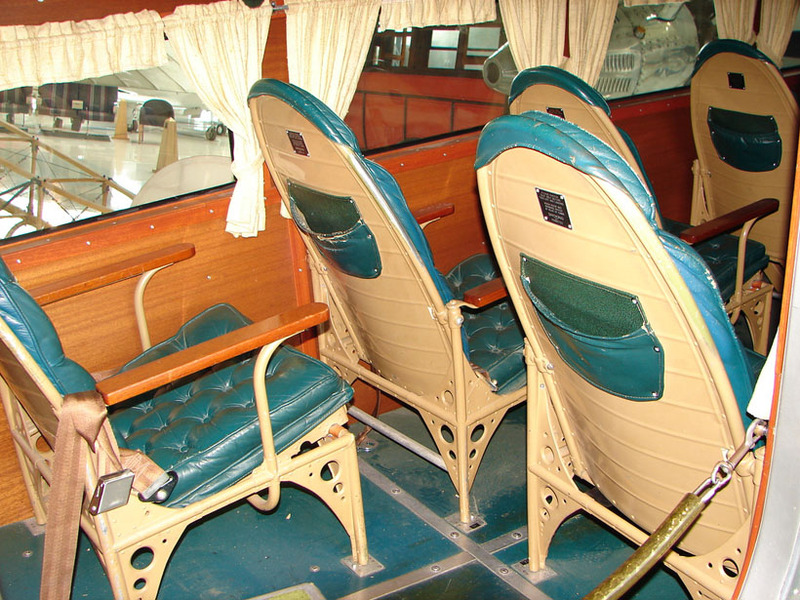 More on my website on this vintage transport can be found here and here. "Here are a few shots taken 14 & 15 June 2007 of Otter C-FMAU. 15JUN it had its first test flight and all went well. 14JUN I met its new owner, Canadian aviation icon Max Ward and I found him to be a very friendly man with many stories to tell. 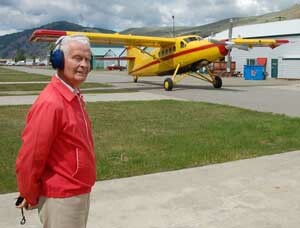 He is still going strong at 86 years of age and he came to Vernon to supervise the test flying of his Otter. He travels from Edmonton in his Beechcraft King Air C-FAFS, with his crew chief and others. The floats are remanufactured as new by Seaflight Industries here in Vernon and they are perfectly done." 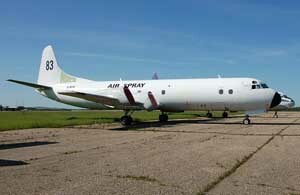 C-FMAU was regististered to Marjorie Ward of Edmonton,ALB on 23may07. 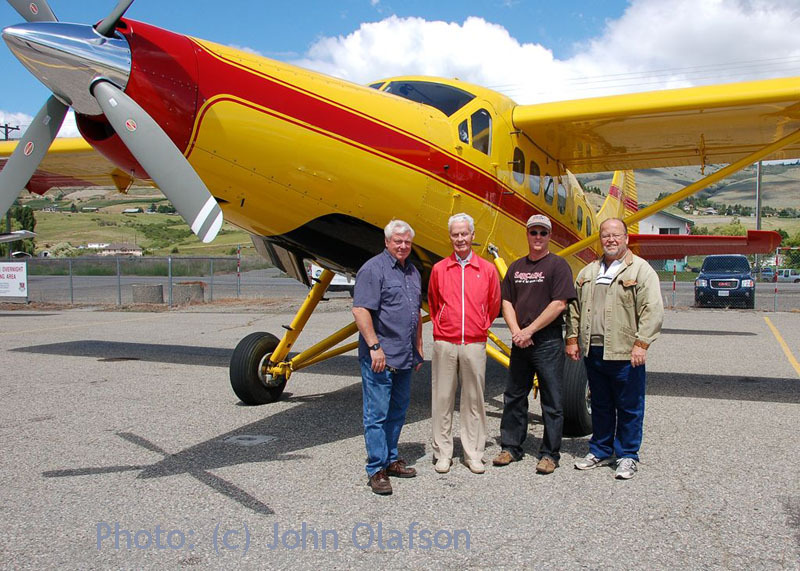 "The group photo shows left to right: Dave Crerar of Vernon who is Max's pilot, Max Ward, Bobby Bishop - Pres Texas Turbines and Test Pilot, yours truly. (shameful of me but I had to have my photo taken with Max Ward). It will be here in Vernon for a couple more days at least while they finish a few interior details. It sure looks nice......the boys at Kal Air Repair did some fuselage paintwork and gave it a complete cleaning and polishing. Max told me he may not repaint it at all, because he likes it the way it is." 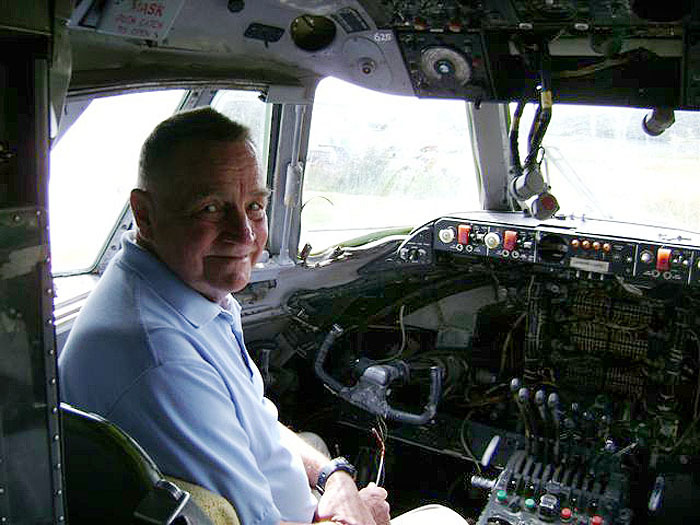 John Olafson encountered C-FMAU again in May 2008, witnessing its transfer from wheel to floats. 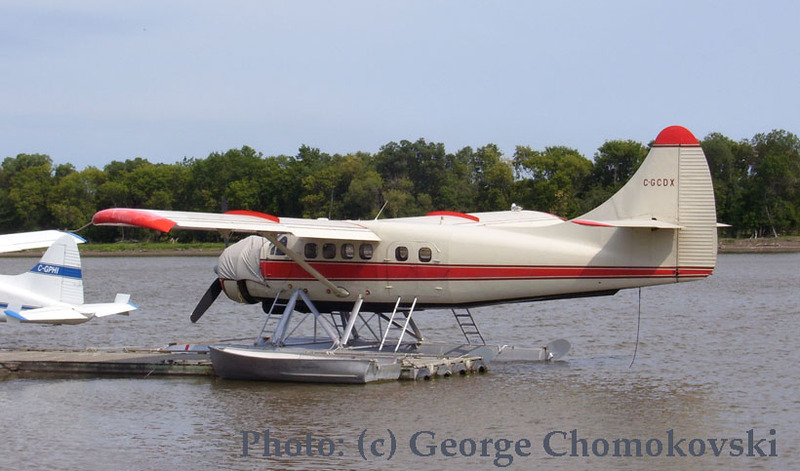 Otter c/n 74 was delivered to the Manitoba Government Air Service on 09Feb1956, registered CF-MAU. It was joined in Jun58 by CF-MAX. The Otters were based at the Winnipeg Airport, at the Government Air Service hangar but deployed to Lac du Bonnet and other summer bases each year. Both Otters were destined to enjoy very long service with the provincial government, during which the operating division underwent some changes of title. Initially this was the Department of Highways and Transportation, later the Department of Mines and Natural Resources, then the Province of Manitoba Air Division and most recently Air Services. Lac du Bonnet was also the summer base of the RCAF's 111 Communications & Rescue Flight and its Otters from 1955 to 1962. As well as Lac du Bonnet, the Air Service also had an all-year round base at The Pas. Summer only bases were at Norway House and Wabowden. By 1962 the fleet stood at the two Otters and six Beavers. 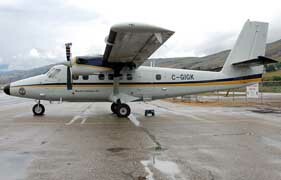 The Otters were used for the following tasks: general transportation of government personnel and freight; detection and suppression of forest fires, including water bombing; aerial patrols for Wildlife & Fisheries programmes; placing and servicing of field parties for the Mineral Resources branch, Surveys branch and others; emergency flights and medical evacuations; northern highways surveys and winter transportation programmes; general transportation for Manitoba Hydro and Manitoba Telephone System. The Otters spent most of the summers on forest protection duties, fitted with floats equipped with water-bombing gear. They were converted to wheel-skis for winter operations, enabling them to fly year round. Only one minor incident was recorded for C-FMAU. On 30Jul88, while approaching to land at Lac du Bonnet, the float-equipped Otter landed too close and ran up onto the shore, coming to rest on the harbour breakwater. 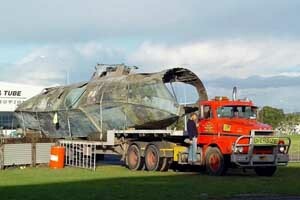 The Otter sustained damage to the floats and some damage to the 156 fuselage at the rear float attachments. The damage was repaired. In May89 the two Otters were joined by C-FODY, which had previously been operated by the Province of Ontario. 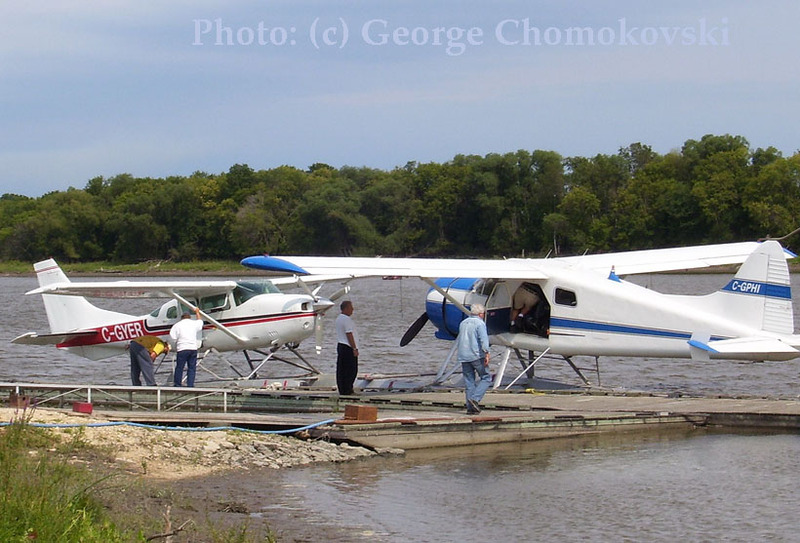 Describing the activities of his three Otters in May 2000, the Manitoba Government Air Services Chief Pilot Stephen Doolan wrote: "The three Otters are operated in summer on floats and one in winter on wheel-skis. Two are based in Thompson on the river and one at Lac du Bonnet. Island Lake, an aboriginal community, is an occasional base in summer". "The Otters range as far north as the Northwest Territories border, conducting 'fish cop work' - game warden activities with caribou, polar bears and general fisheries management with the biologists. Fuel drums and freight are often a cargo to bush camps for ground fire-fighters at temporary fire fighting bases carved out of the bush near an active forest fire. 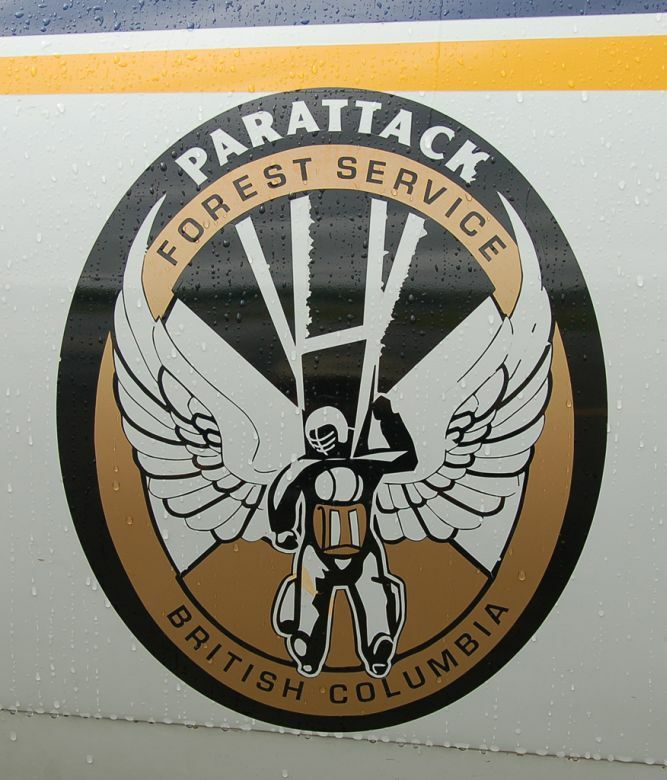 These aircraft are an integral part of the annual operations to fight wildfire starts. 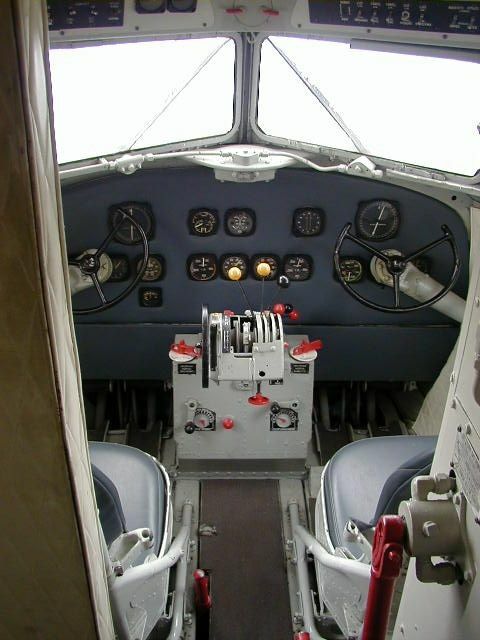 All three Otters are equipped with a waterbombing system in the floats, allowing the pilots to skim the water and scoop approximately 170 gallons depending on fuel load. 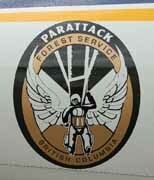 They can drop the water on a new forest fire, preventing it from spreading until the heavy waterbombers arrive. Often they will go out on patrol with an initial attack crew, drop them off near the site of the fire and then begin waterbombing. There are no plans at present to replace the Otters as they are unique in what they do. We may look at one of the engine conversions to increase performance". Forty eight years after it was first delivered, 'MAU continued in service with the Manitoba Air Division. 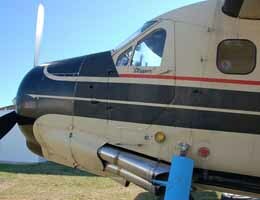 It received a new R-1340 engine at Thompson, Manotoba during May04, before deploying to Lac du Bonnet for the summer season, flying barrels of fuel to such places as Bloodvein, Berens River, Little Grand Rapids etc in support of fire fighting aircraft and moving government personnel around the bush. 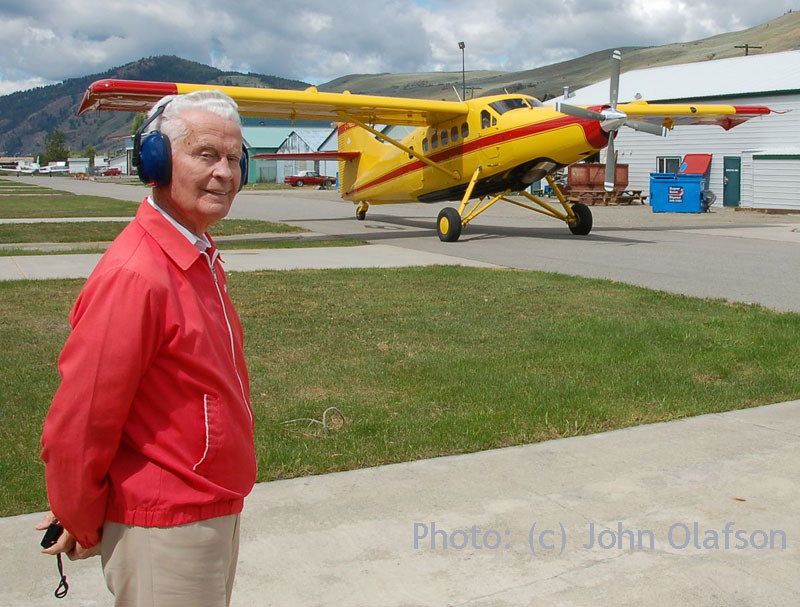 And as we can see C-FMAU recently received a new lease on live and in what better hands than those of Max Ward, for whom the DHC-3 Otter initially was a prime tool to venture commercially into the Arctic North from his base Yellowknife,NWT.